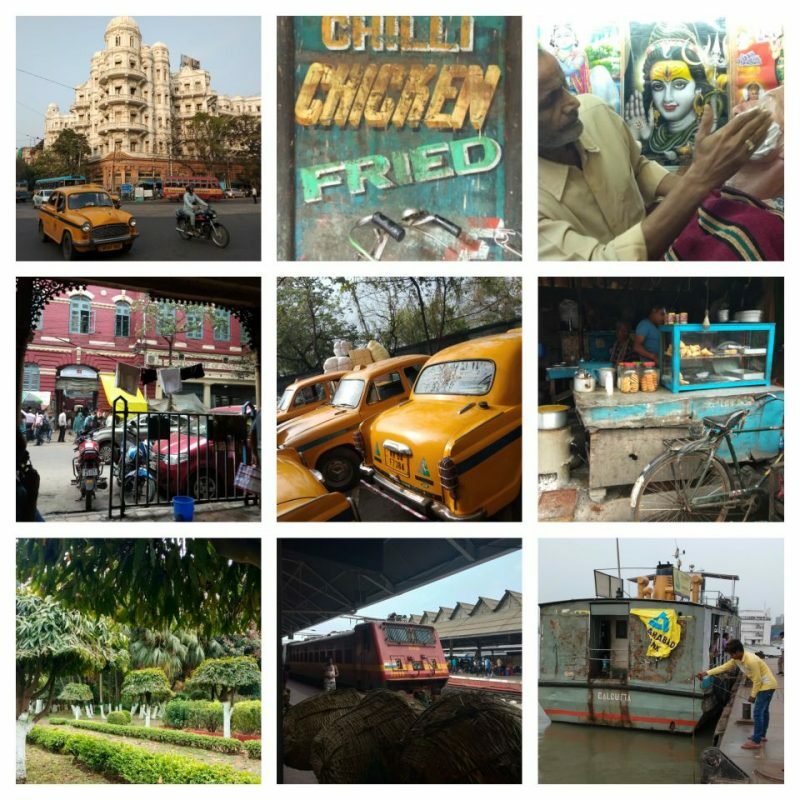 Next stop Kolkata, West Bengal (3 hour taxi from Khajuraho to Satna then 20 hours on the train to Howrah Station), which we approached with some trepidation. For a huge city it was, however, a revelation: friendly, fairly relaxed, fairly clean, really beautiful and easy to negotiate on foot. 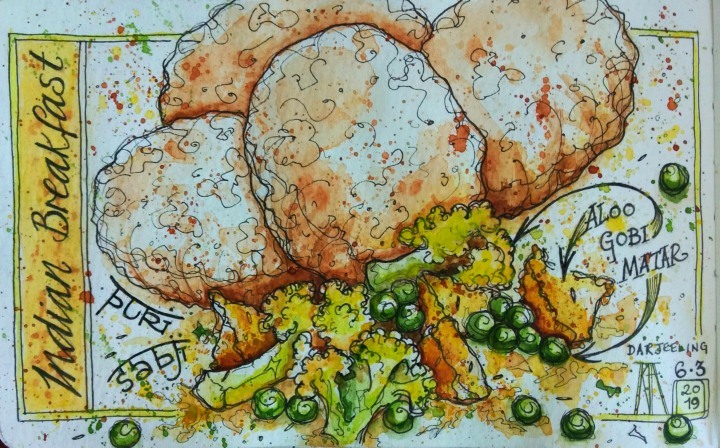 With cheap, delicious street food to boot; Kolkata is famous for kati rolls – egg dipped flat breads which are fried and rolled around the tasty filling of your choice. 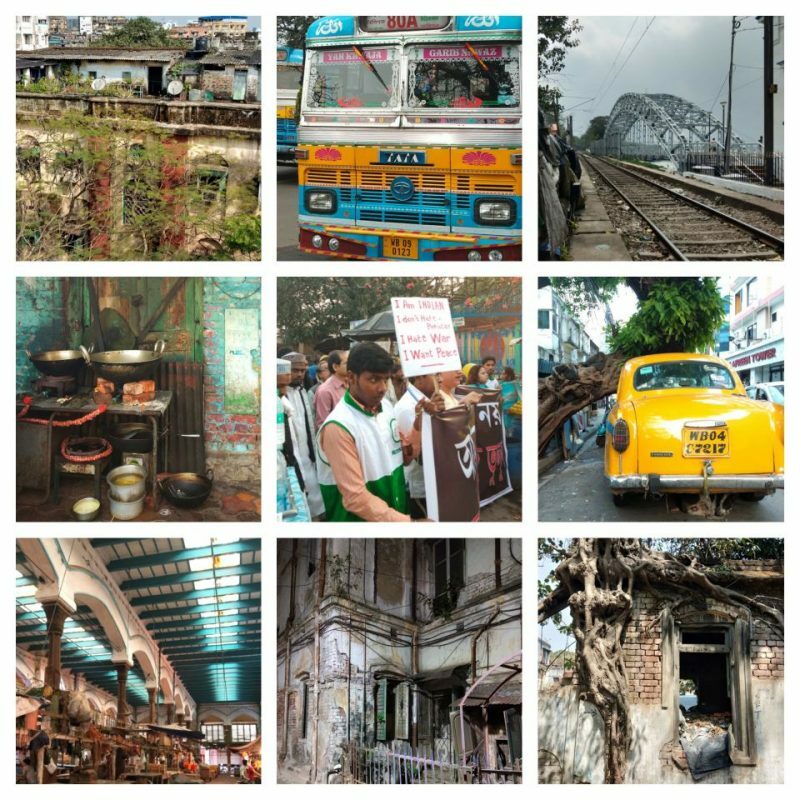 We passed a few fun days wandering around the Park Street neighbourhood, exploring the city’s green spaces and crossing the Hooghly River by ferry. 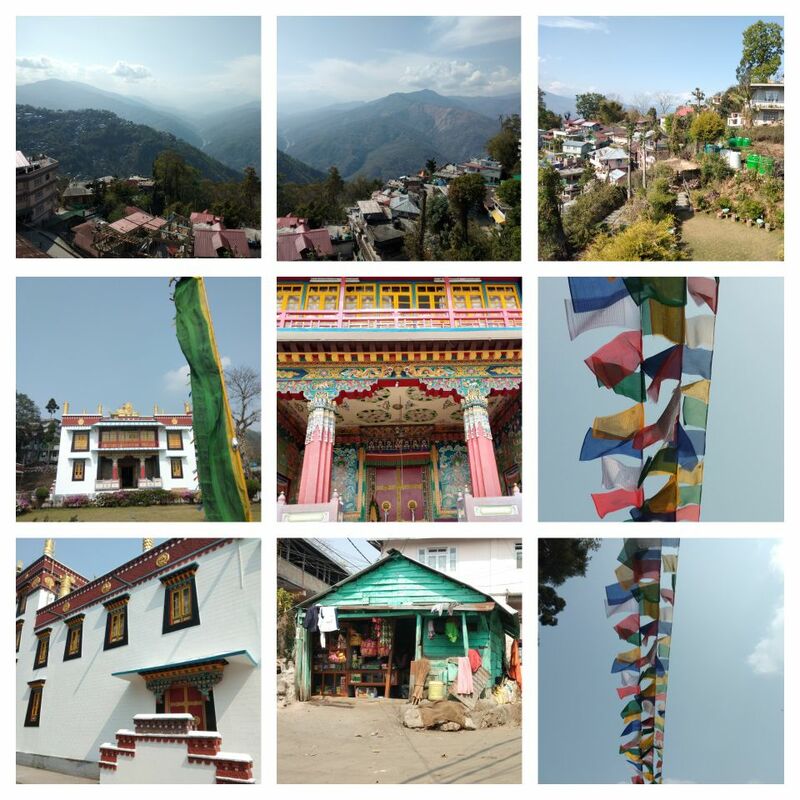 Our next target destination was Darjeeling the famous tea town. 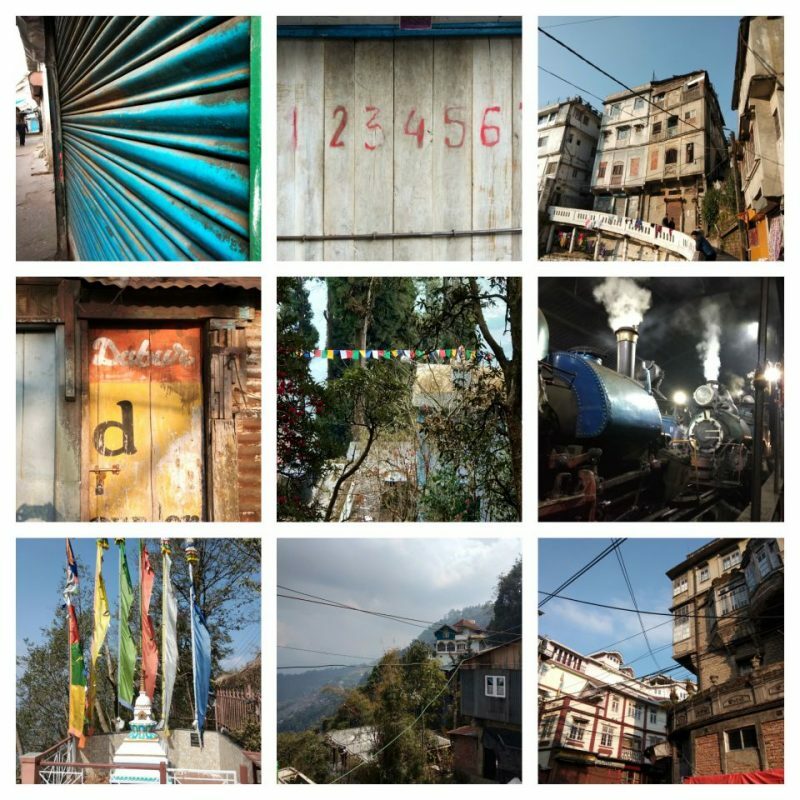 I had a romantic idea of Darjeeling – quaint and charming, nestling up there in the Himalayan foothills and the opportunity to arrive there in the heritage ‘toy train’ was irresistible. 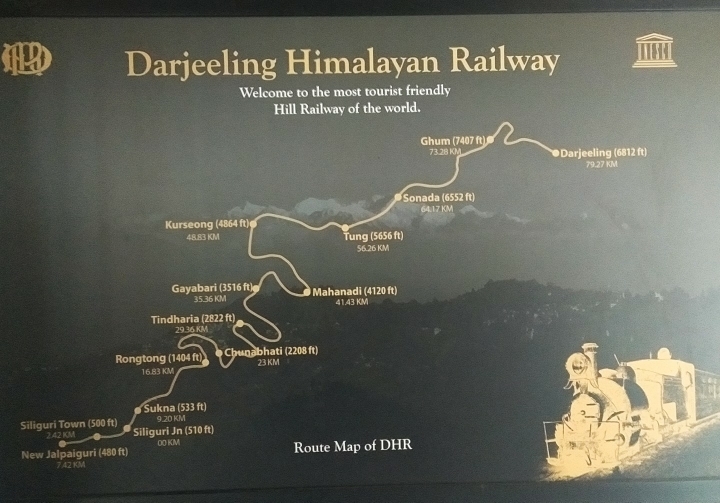 We flew to Bagdogra, spent the night in Siliguri and the next morning promptly arrived at New Jalpaiguri Station for the advertised 8:30am departure of the Darjeeling Himalayan Railway service from the narrow gauge platform. At least an hour late, the tiny engine pulled up with three little carriages in tow. It took at least another half hour for the engineers to prepare the train for the trip up the mountain. 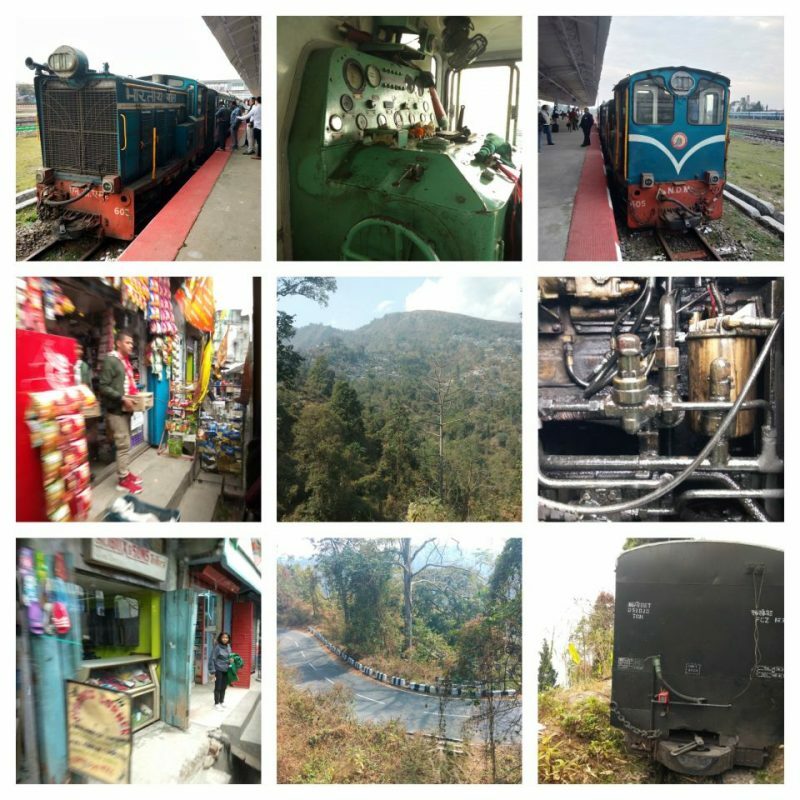 The journey (scheduled to take seven hours in total) was indeed picturesque; the little train pluckily chugged upwards taking several fascinating ‘z reverses’ to accommodate the incline. Then, 15km short of Darjeeling a piece of the engine fell off, the train stopped and it became apparent that we would have to make our own arrangements to finish the journey by road. Luckily, at dusk, after an hour or so of flagging down vehicles with little or no space for hitchers the lovely man (second right) in the photo above pulled over. He breezily packed us and our new German friends and all our luggage into his warm, comfy car and expertly drove us the hour to town. The first first thing that struck me was the cold. A see your breath in the house cold. A wear all your clothes in layers, in bed, cold. Luckily our homestay host provided a heater and hot water bottles and the view of Kangchenjunga from the balcony (at 6am before the clouds rose) was stunning. The food was fabulous too, inspiring me to immortalise this delicious and typical Indian breakfast of puri sabji. The puri are fried flat breads which puff up and are chewy and crispy at the same time. Sabji or sabzi is the generic word for cooked vegetables, usually in some sort of gravy. We met up with our new German friends in a local Tibetan style restaurant to reminisce about our toy train misadventure and feast on momo and wanton (both dumplings)…a meal so delicious I was again inspired to capture it in paint. Of course we drank some excellent tea in Darjeeling too and took the obligatory tour around the Happy Valley tea factory. 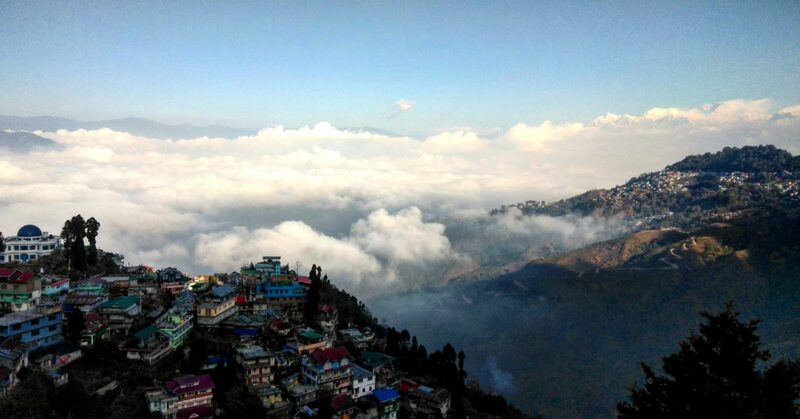 But Darjeeling is not the charming hill station town of my imagination; it has a few pretty parts but is generally damp and dank, congested with traffic which makes the air foul with fumes and suffers from cascades of rubbish dumped down its sprawling labyrinth of terraces. We spent our last Darjeeling days at another homestay, the beautiful Little Singamari and were treated to yet more fantastic home cooking. 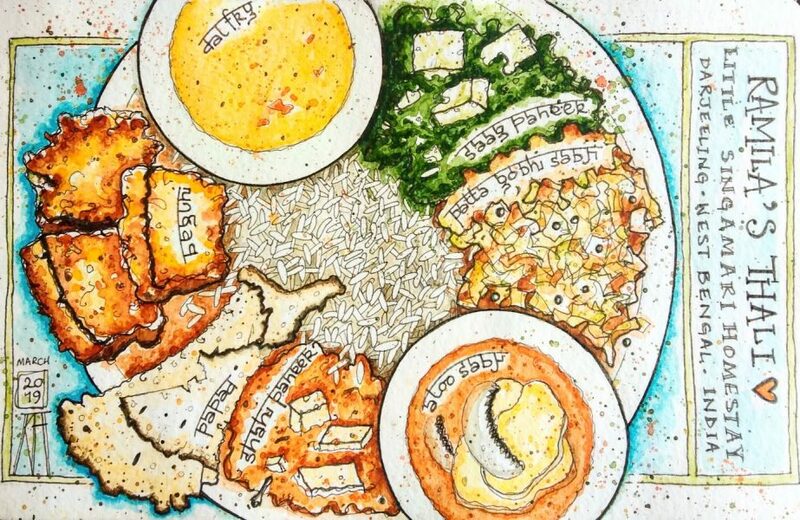 This is a fantasy amalgamation of my favourite dishes cooked by Ramila, our hostess. 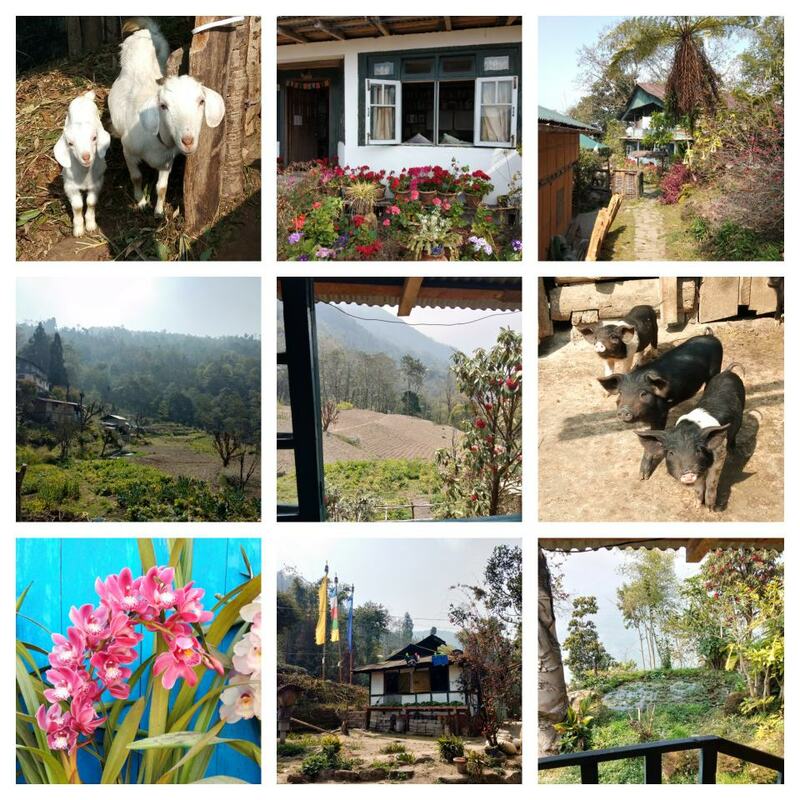 We set off for a few days in Kolbong and stayed on an idyllic organic farm. The two hour jeep ride to reach the farm was a bit of a roller coaster ride, one local lady promptly threw up as soon as she exited the jeep at her stop. Luckily the driver made a slight detour for us so that we didn’t have to drag our luggage up the last kilometre of track to the farm. The weather was warmer, the air cleaner, all our food was home cooked, mostly homegrown and organic. Our hosts were delightful but could only accommodate us for a few days as they were busy with another project. It was hard to leave. 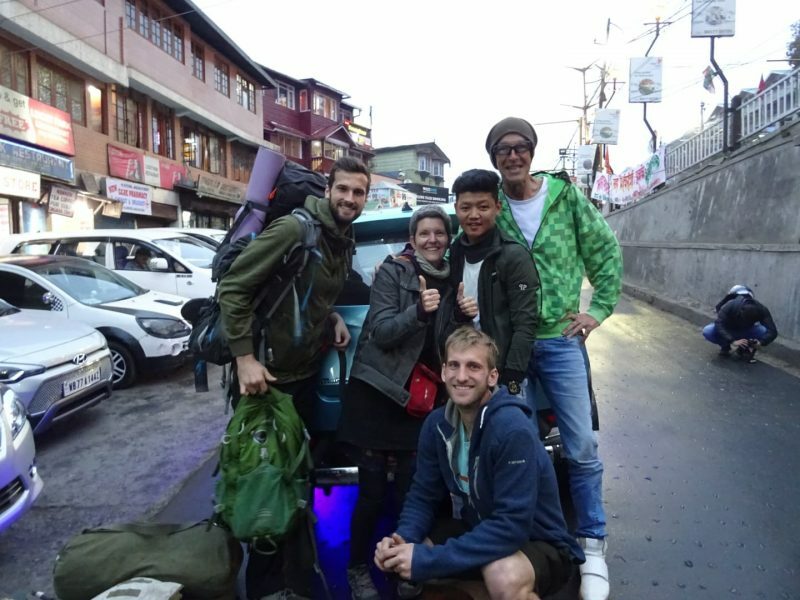 We decided to head for Kalimpong, a chilled out town with a similar climate to Kolbong where we could wait for the weather to warm up before we set off to explore higher altitudes without freezing. We both succumbed to bugs, one respiratory and one gastrointestinal, nothing major but enough to make us grind to a halt. Luckily we were in safe, comfy accommodation with a nice view…a good place for rest and recuperation. 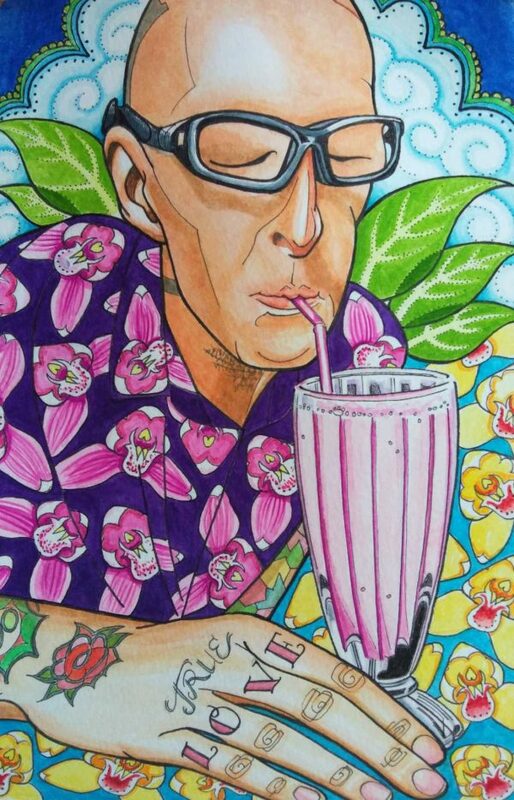 I was inspired by the gorgeously bright colours used to paint the murals in the prayer rooms at two of Kalimpong’s Buddhist monasteries when I made this portrait of Rob. I also love the way they include the cloud and flower motifs. Kalimpong is well known for its orchid nurseries hence my choice of flower. 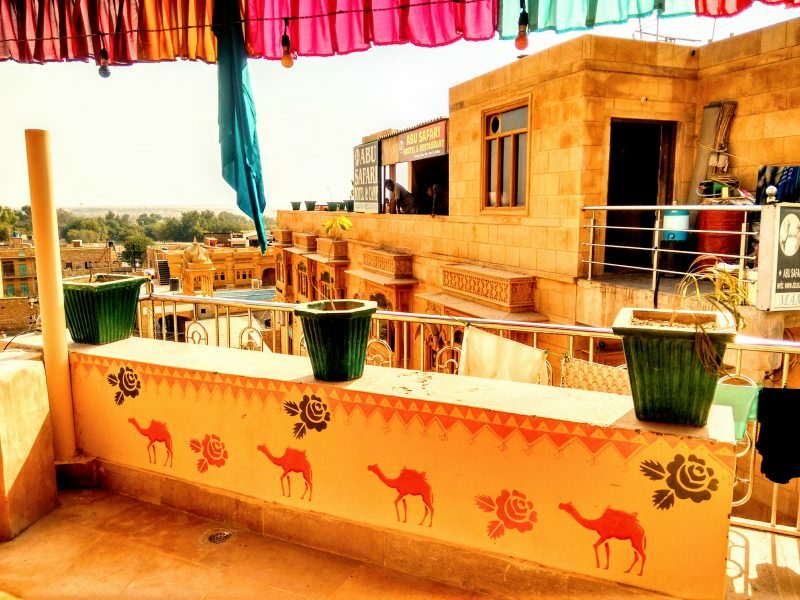 I chose to do a Workaway at a hostel in Jaisalmar because I wanted to go on a desert safari and the hostel owner said he wanted some help to decorate the rooftop terrace (along with some basic IT tasks). 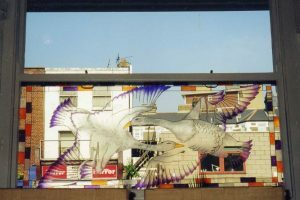 When I got here it was apparent that many people had already contributed to the roof terrace decoration…some in a lovely way, some in quite a haphazard way! 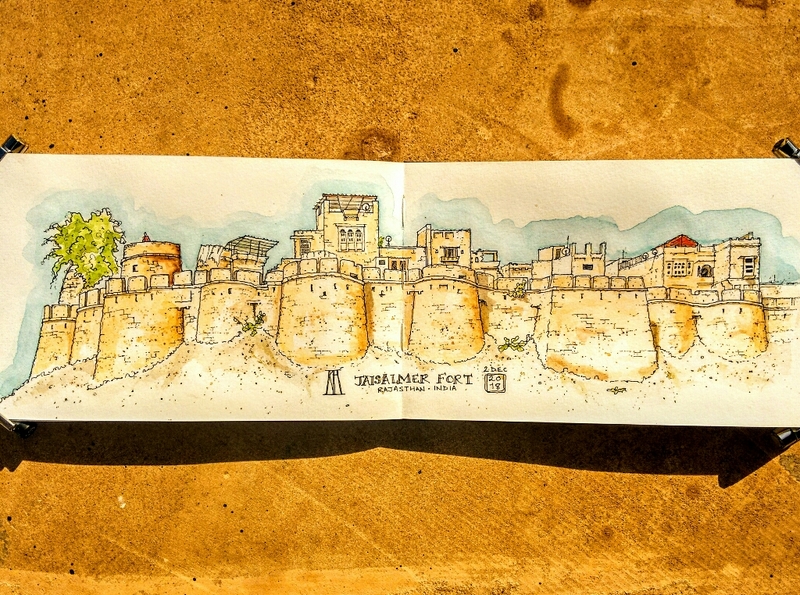 So, my exclusive rights to the wall space scuppered I set about capturing the beautiful view (above) of the fort while planning my strategy for mural painting in limited areas amongst a hotch-potch of other images. 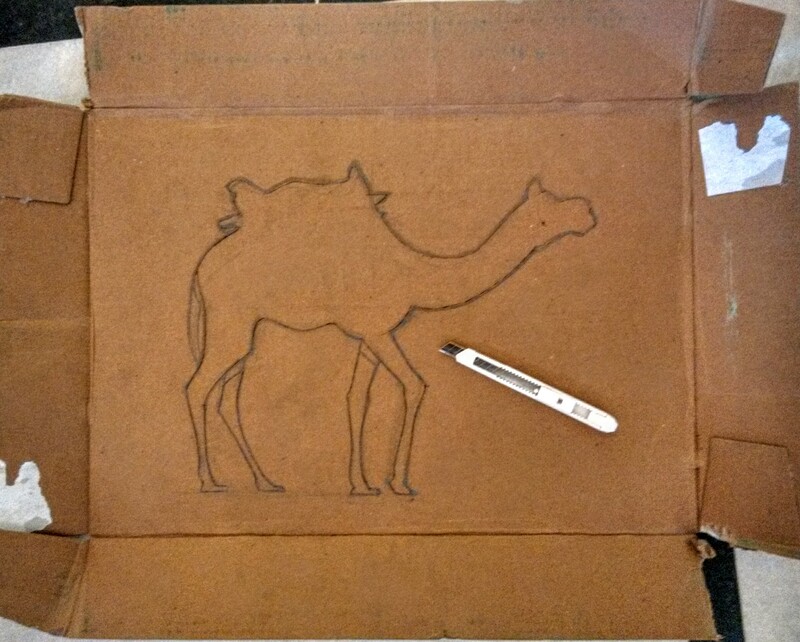 I decided on a stencil with the .most obvious theme for a desert safari hostel – the camel. 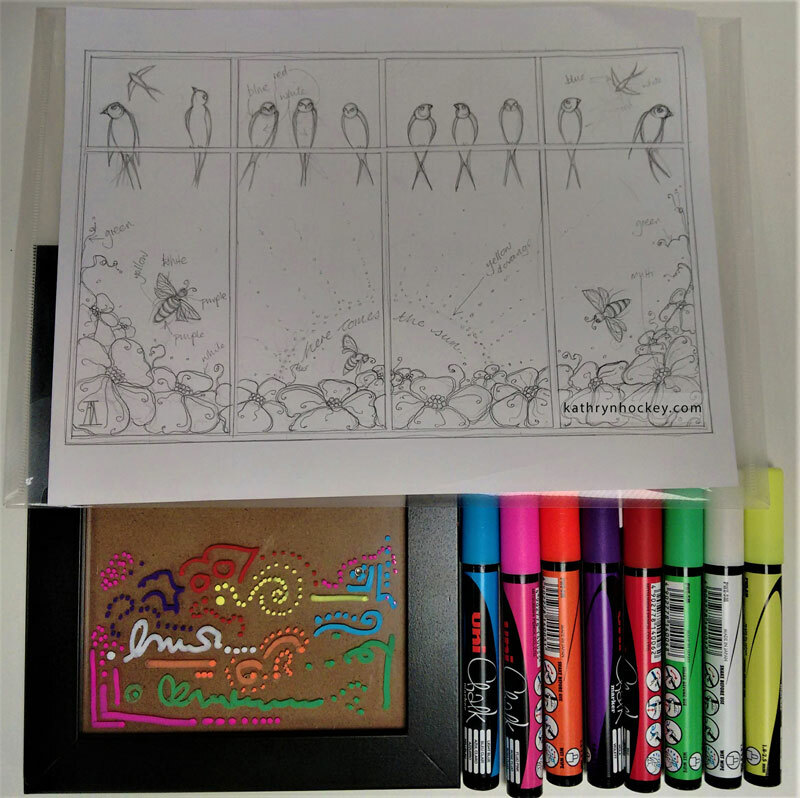 I found a craft knife and the lid of a photocopy paper box in the market by the fort and set about preparing my template. 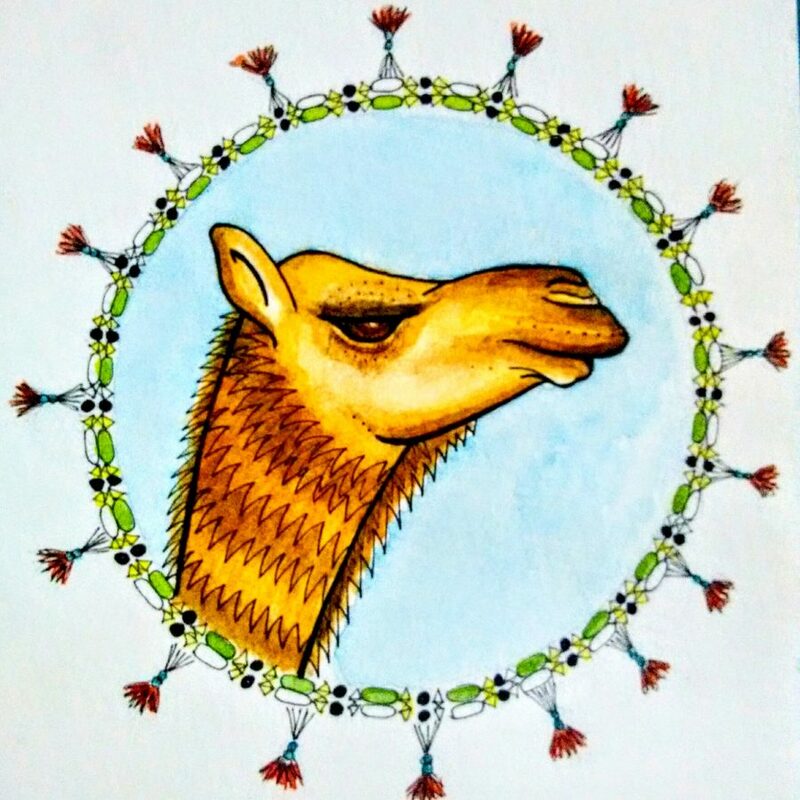 Having painted several camels, a bit of red shading and yellow highlighting I added a border inspired by a Rajasthani folk art design. 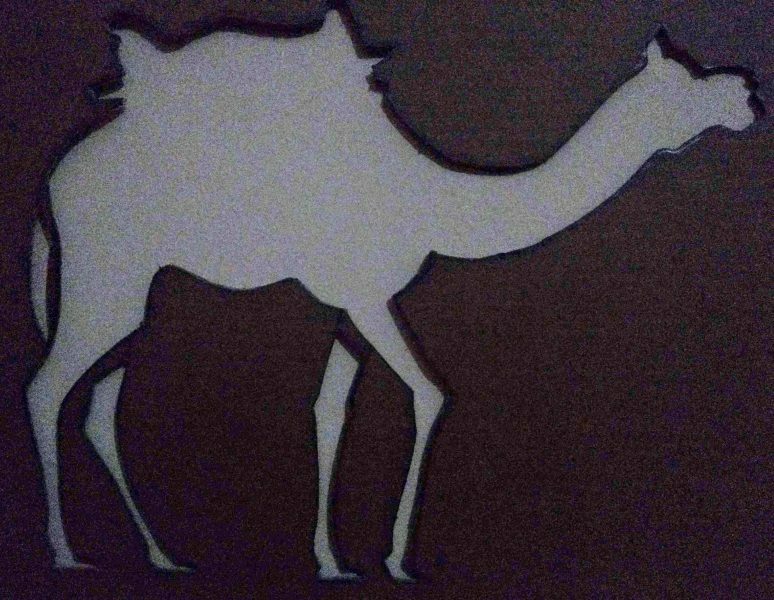 I did go on a camel safari, it was tremendous fun if a little hard on the thighs. Even though we didn’t venture very deep into the Thar desert the peace and vastness of the landscape were still impressive. We had chai on the dunes while watching the sunset, then ate dinner around a campfire before settling down to sleep under the stars. Gorgeous. 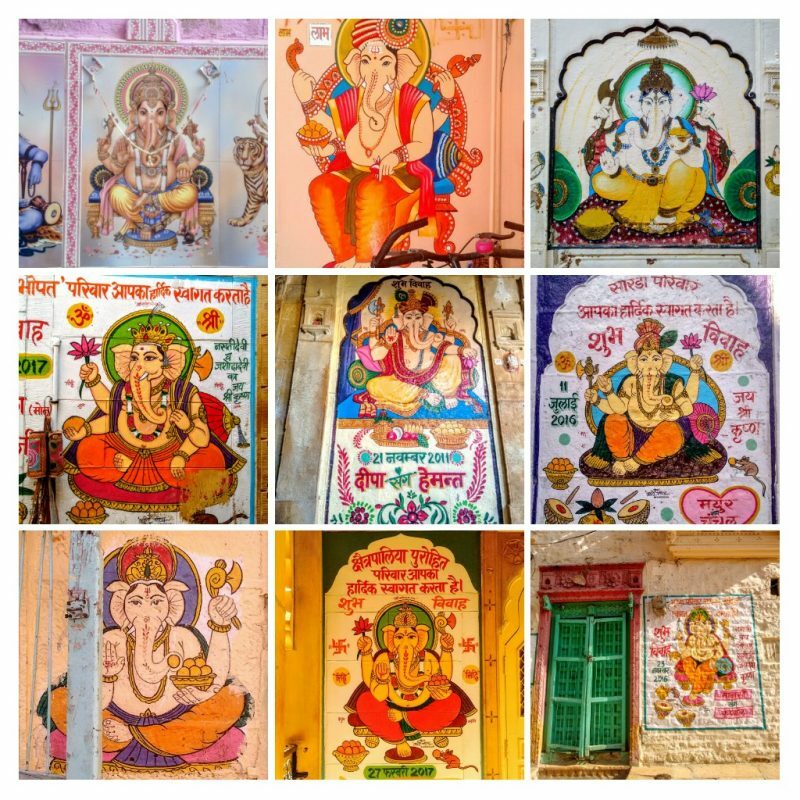 While wandering around Jaisalmar old town I was struck by the number of Ganeshes painted on the houses. 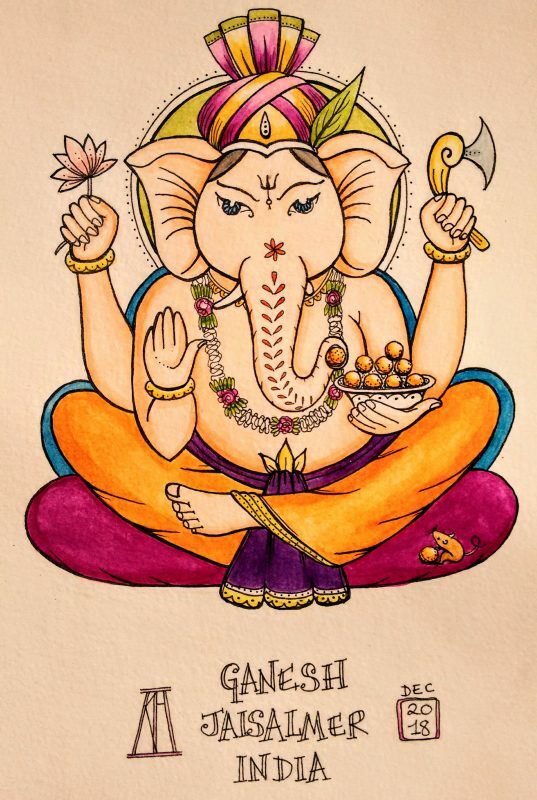 Then someone told me that since Ganesh is the Hindu god that removes obstacles and blesses new starts the people get him painted on their houses every time there’s a wedding. In fact the paintings serve as a kind of invitation since they contain the names, date and location of the union. Ah-ha! Then I got invited to a wedding! I went up to the fort for a massage, my second in a week since hard beds, overnight travel and painting have taken their toll on my middleaged bones. 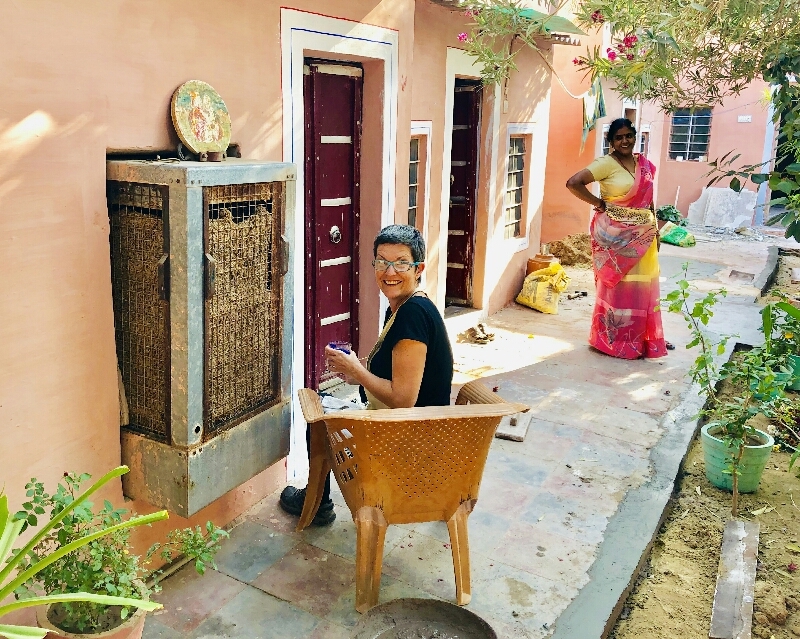 There’s a team of sisters who offer Ayurvedic loveliness in their home but the house was very busy when I got there so I expected to be turned away. One of the sisters explained that they were preparing for her niece’s nuptials and I got my massage and an invitation to the part of the wedding ceremony which would take place two days later. 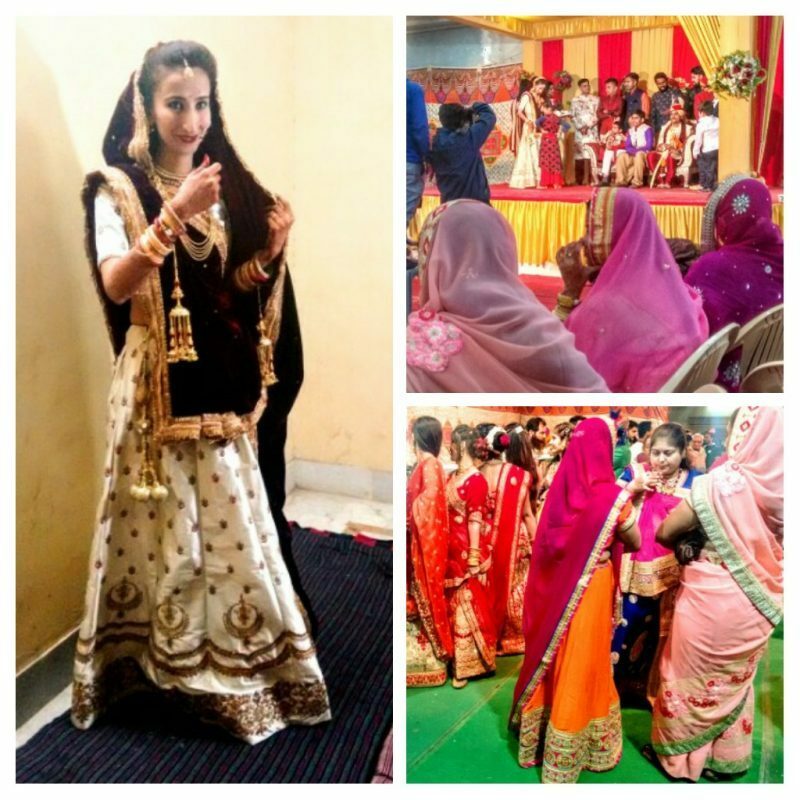 And it was a delightfully colourful evening – the whole marriage ceremony takes place over several days and nights and costs the bride’s family an absolute fortune. There were saris of every hue, mountains of delicious food being cooked and consumed (the bride’s family aren’t allowed to eat though) and a cocophany of drums and firecrackers when the groom finally arrived at midnight. He strode moodily to the stage at the front of the main room at the ashram and sat on a sofa. The bride, who was hidden in a back room for most of the evening then walked to the stage under a kind of awning. The groom appeared to ignore her completely for a good long while. I left the party at that point. I saw the bride’s brother a couple of days later. He said his whole family were exhausted after the extensive marriage ceremony – the final part of which lasted through the night. They were also grieving the loss of the their sister / daughter / niece from the household but grateful that at least she still lived in Jaisalmer. He added that he had already started saving up for the eventual wedding of his eight year old daughter. 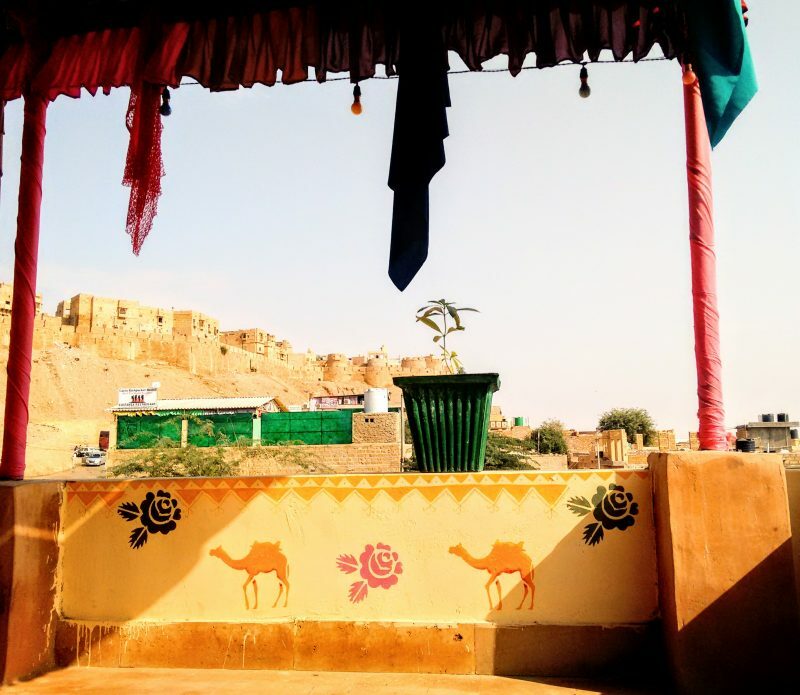 Jaisalmer has a frontier town feel – it’s close to the border with Pakistan and there were several days when there were fighter jets roaring overhead (Indian government posturing I was told). It’s certainly the most ‘male’ place I have stayed in so far. There were a few women with jewelry and vegetable stalls in the market and a few women street cleaners but their presence was mainly domestic and behind closed doors. There were no female staff at the hostel and while I was mostly treated with kindness and respect there were times when I had to robustly defend my boundaries around personal space. I did it with as much patience and good humour as I could muster. There is definitely an advantage to sticking around in one place for a bit longer than is usual on the backpacker trail. 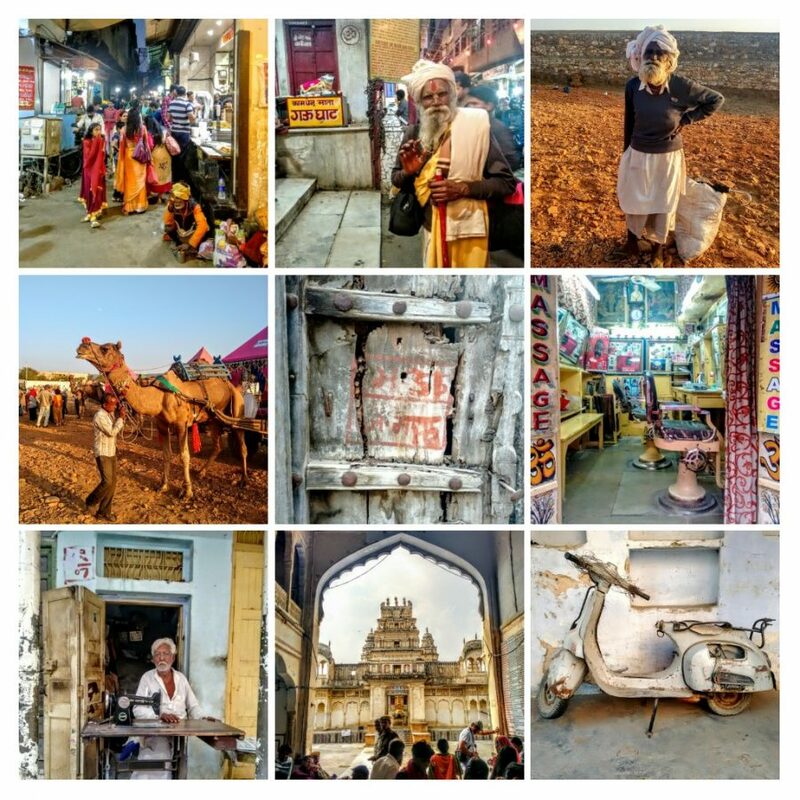 Taking time to talk with local people and other travelers creates deeper connections and insights. 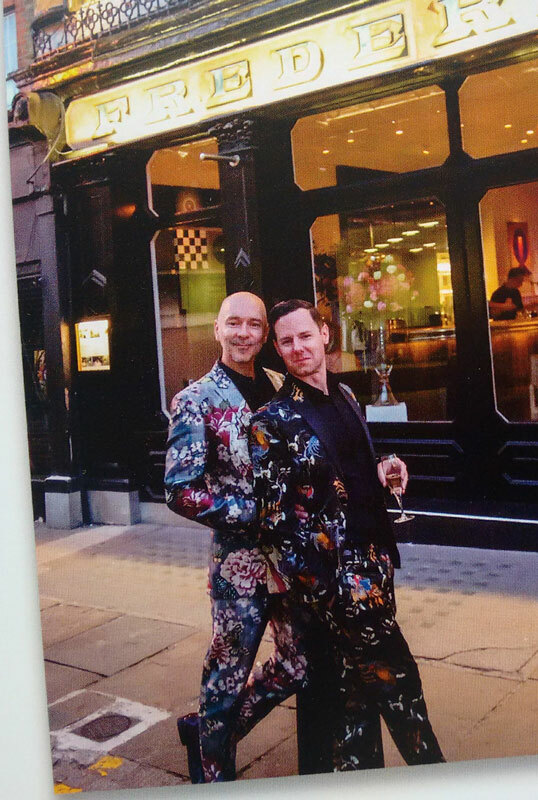 I met a splendid fellow from Spain who went to the wedding with me, then the following evening I joined him for dinner at the home of a delightful local couple who have a shop. They were all so sweet and generous and the food was the best I’ve had in India. 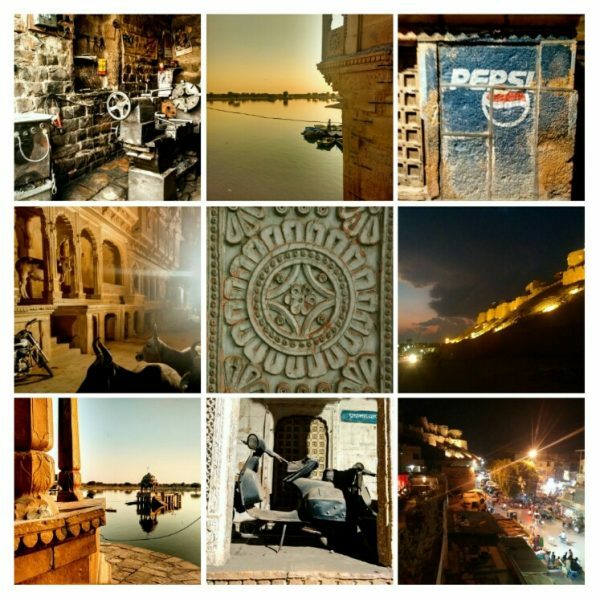 To add to the excitement there was an election for the legislative assembly of Rajasthan on the 7th of December. 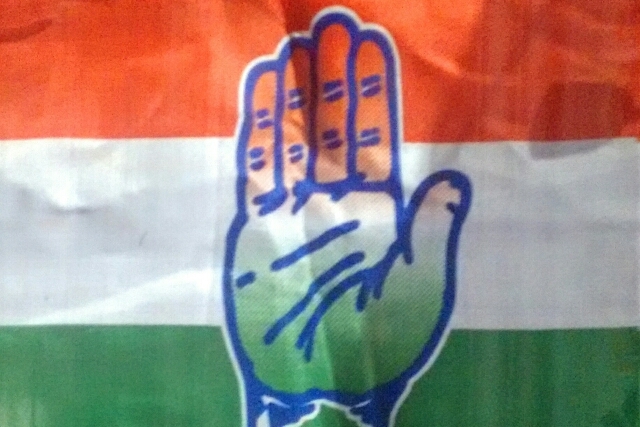 The election takes place every five years and this one was eagerly anticipated because the people were generally bitterly disappointed by the broken promises of Modi and the right wing BJP who won in 2013. The BJP is India’s largest political party in terms of representation in the national parliament. Campaigning for the centre left Congress party (INC) which is associated with the Gandhi family was enthusiastically underway while I was still in Bikaner and in Pushkar there were reminders to vote spray painted on the lakeside ghats. It took four days for the votes to be counted and when Congress was declared the winner on the 11th of December there were fireworks, drumming, chanting and cheering well into the night. 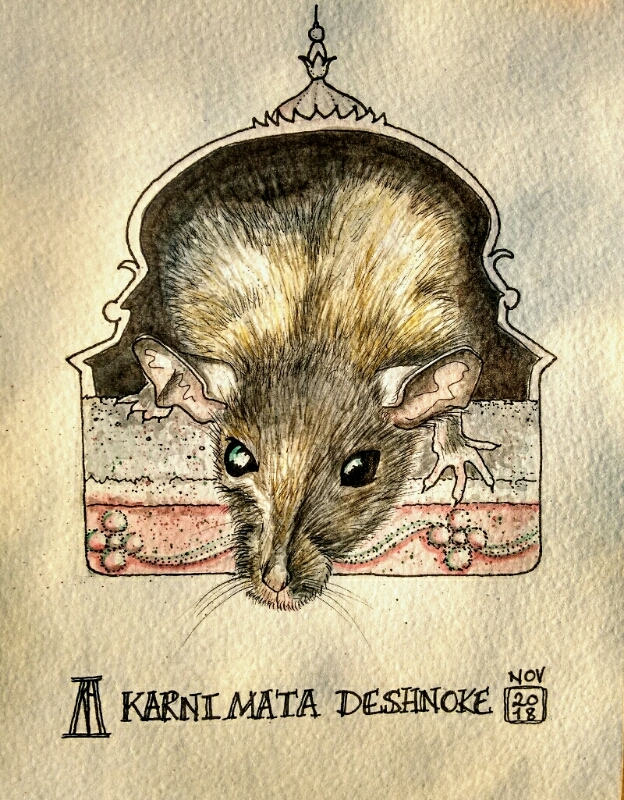 I only intended to stay in Bikaner for two days, just to visit the famous Karni Mata rat temple in nearby Deshnoke (weird I know, but I’m a rodent fan). I painted the little pen and wash study below from a photo I took at the temple. 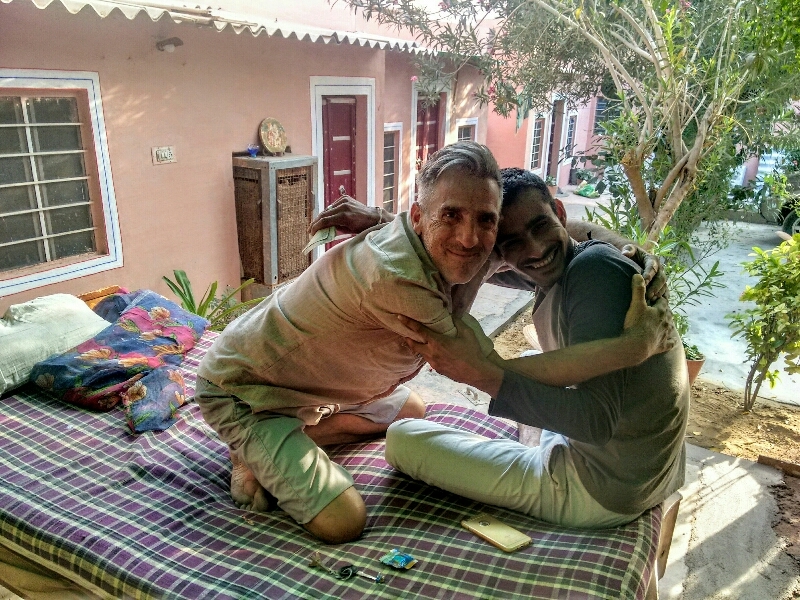 Then I met a guy who offered me free bed and board in exchange for some painting work at the hostel he’s renovating so I stayed an extra three days, and had a lot of fun. 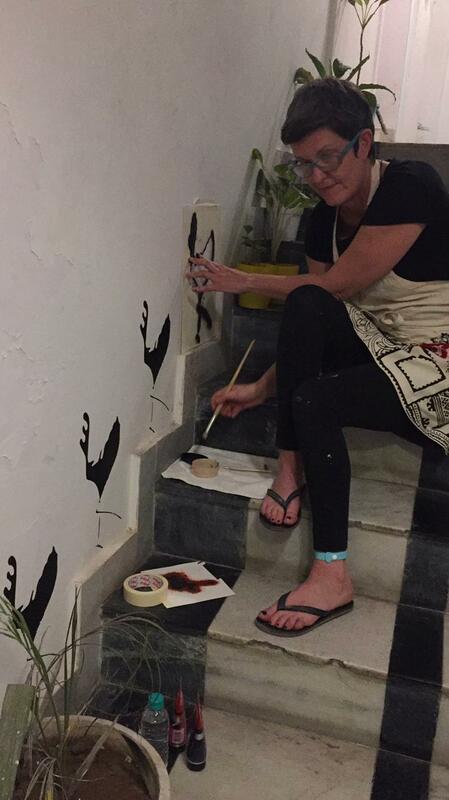 I painted the frames around the doorways and windows behind my hostel buddies in the photo above, and below here’s me finishing off the stripes. That’s Auntie Gee in the background, she owns the place, directs the workers and delivers chai. 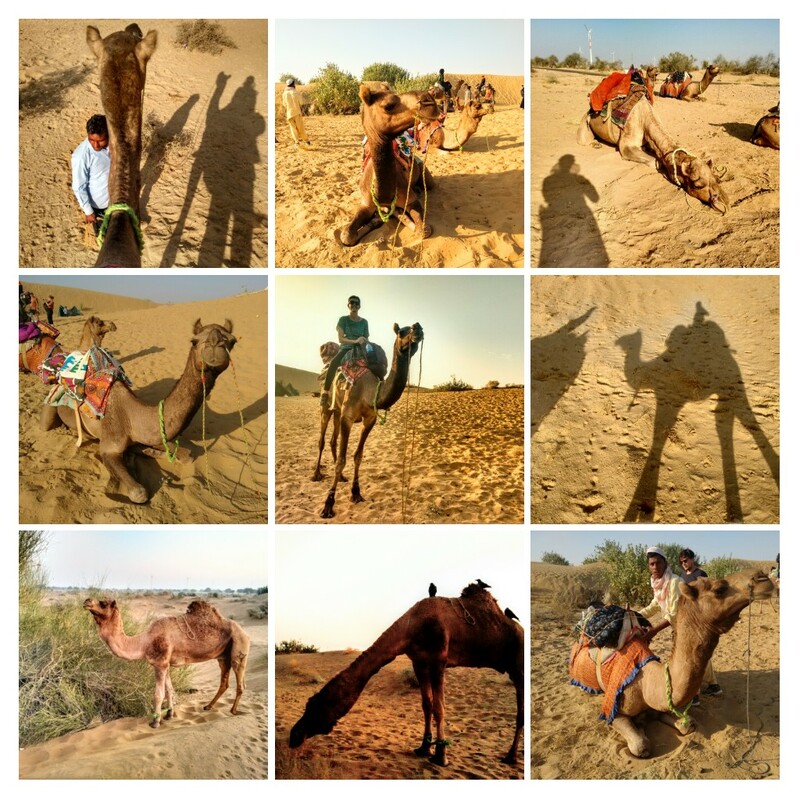 Bikaner is beautiful in a dusty way and largely unspoilt by tourism. There are a number of guesthouses in huge hawelis in the old town which is where I stayed at the start of my visit. Then I moved downtown and took a lovely walk to the market most nights to eat street food near the stunning Bhandasar Jain Temple. 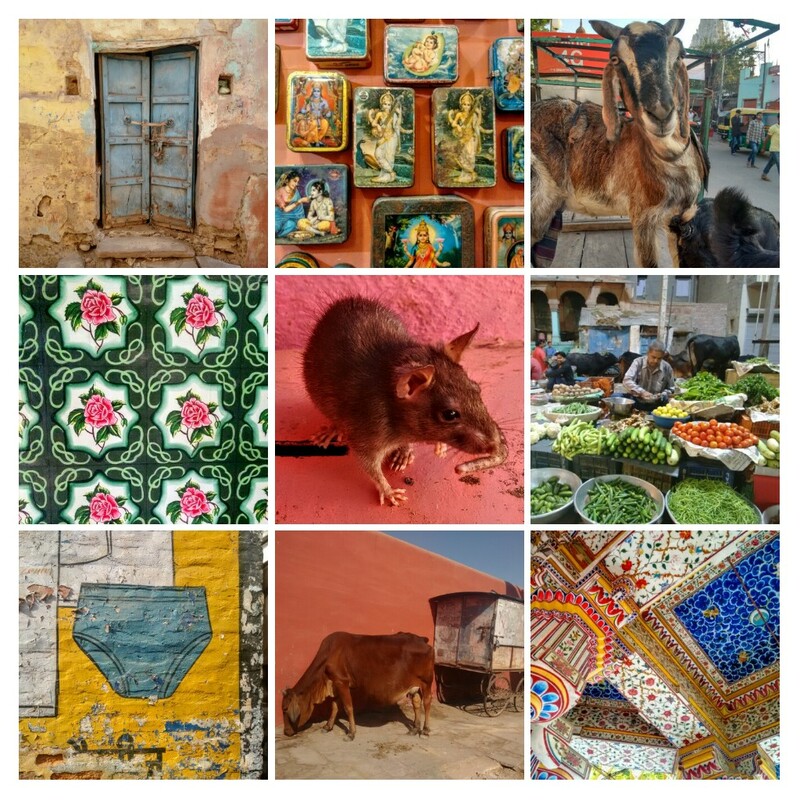 Pushkar has been wonderful; a strange and delightful mix of the spiritual and the decadent with a bit of filth and hassle thrown in for good measure. 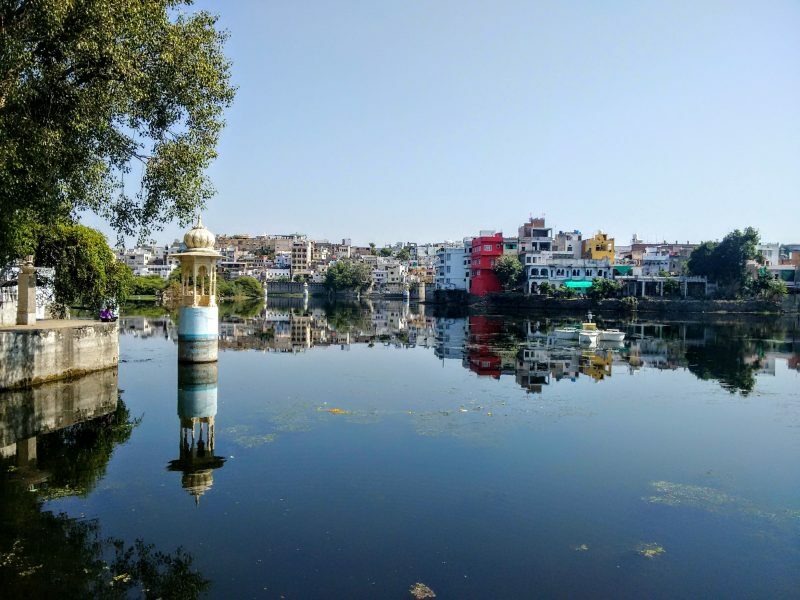 Don’t touch the flowers that are offered down by the ghats (sacred lakeside bathing areas)- you’ll get dragged into a lakeside blessing ceremony and charged well for the honour. 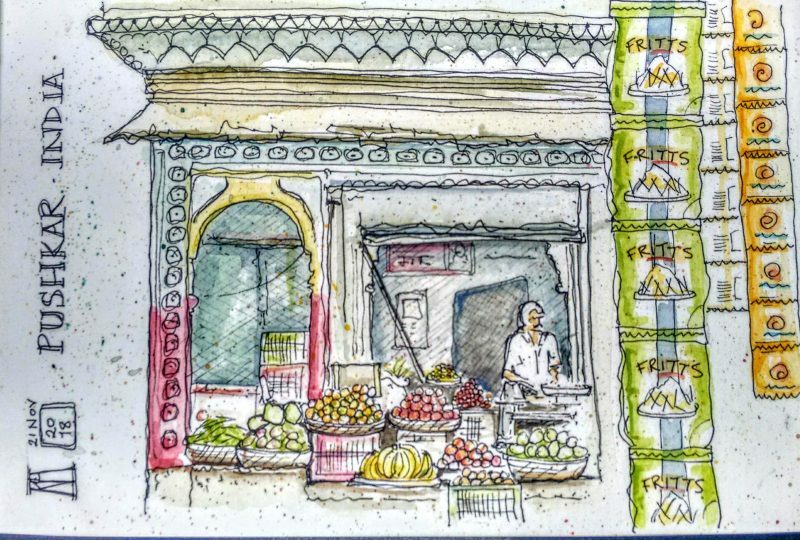 I sat in the doorway with some kind young musicians while I sketched this little market stall. 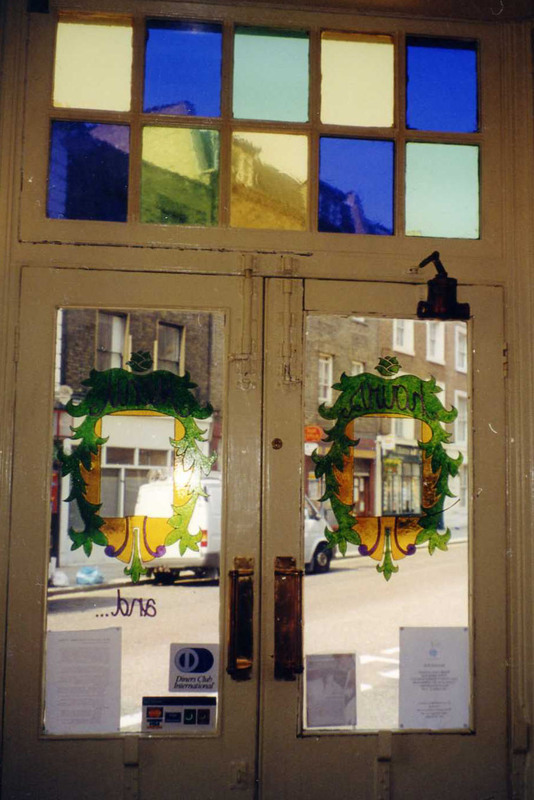 They insisted that I showed the greengrocer the painting afterwards. He loved it. 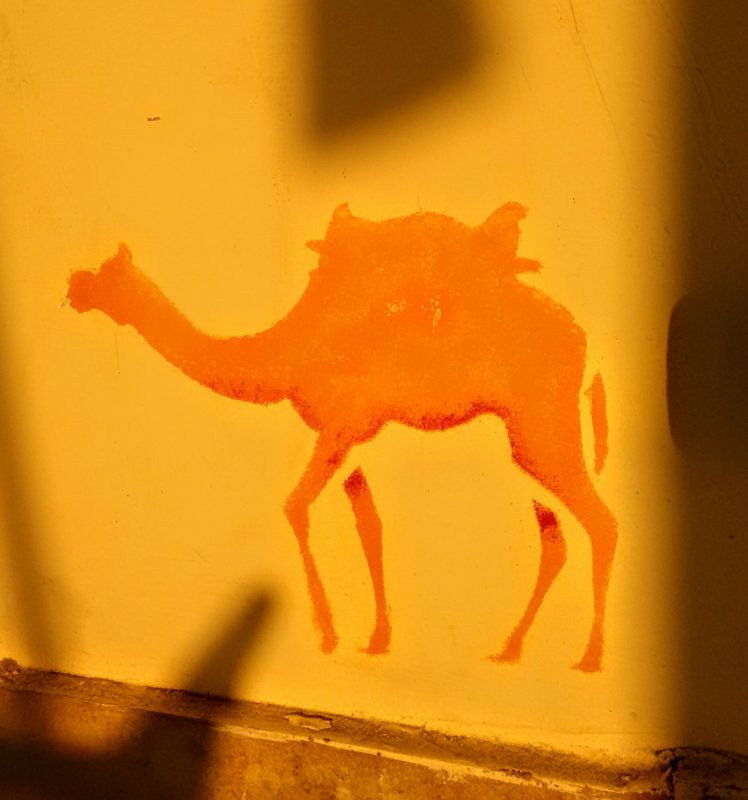 Unknowingly I arrived in Pushkar during the most sacred week of the Hindu calendar, which coincided with the famous camel fair. The streets were full of pilgrims from all over India and beyond. I met an Argentinian Hindu who was staying at the same hotel and he explained a bit about the bathing rituals and took me to a couple of temples. Photography is strictly prohibited at the lakeside so I thought I’d sketch the scene instead. The photography ban didn’t stop me being asked to pose for a couple of pictures! 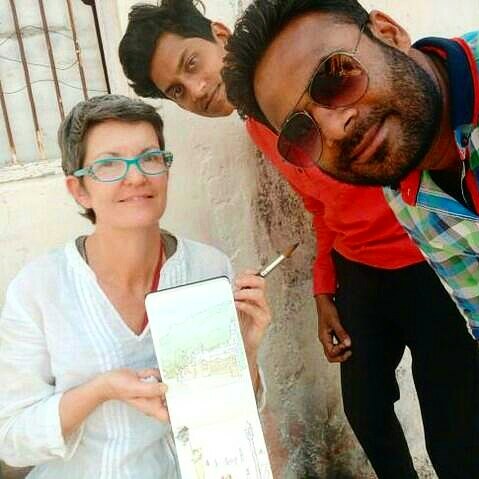 In Udaipur I met a lovely young camel expert from New Zealand who spoke so passionately about the camel fair that I decided to visit. 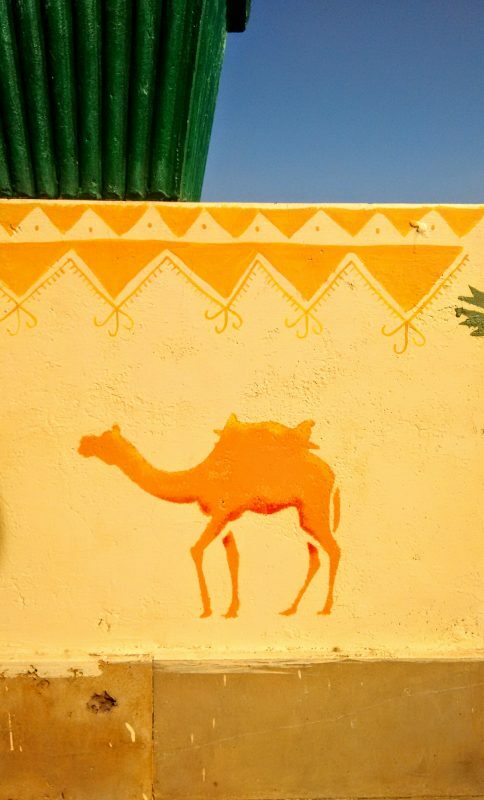 When I arrived in Pushkar I met up with her again and spent a very interesting hour or so meeting the camels. They’re surprisingly sweet and dignified. 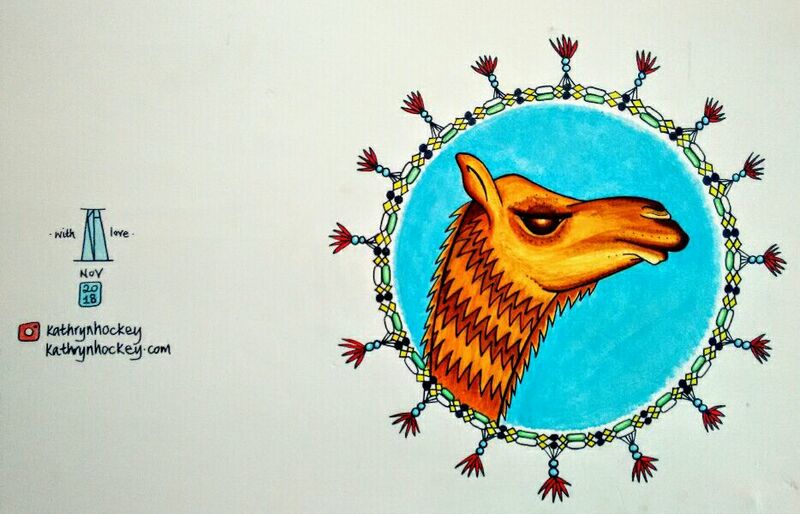 Inspired, I drew the camel above, the circle is a design based on the ornaments the camels are dressed with. I then painted this version on the hotel wall before I left. 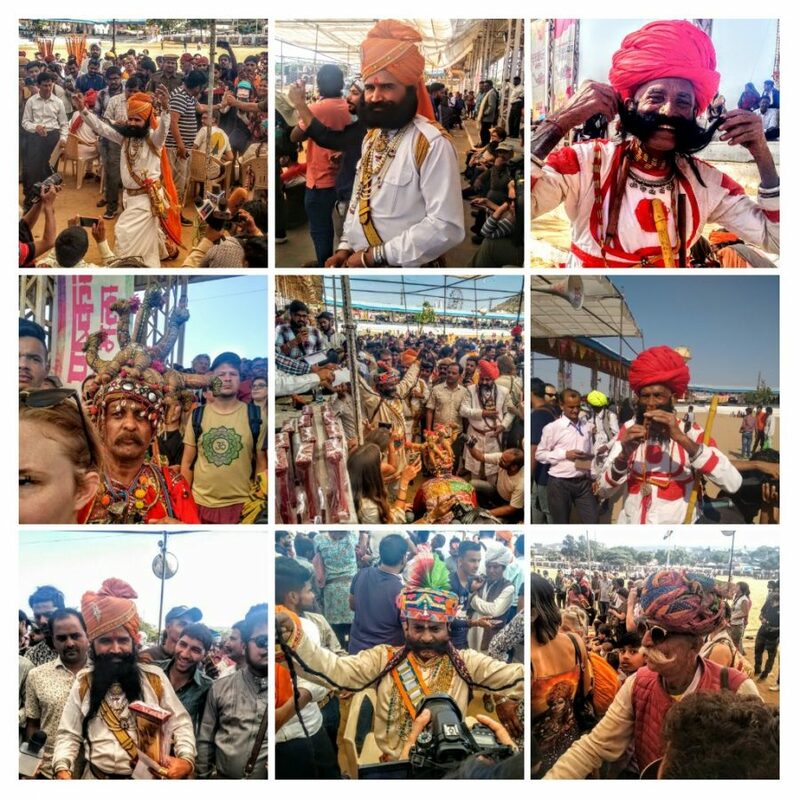 The annual moustache competition was a hilarious highlight of the camel fair – Rajasthanis are certainly blessed in the hair department! 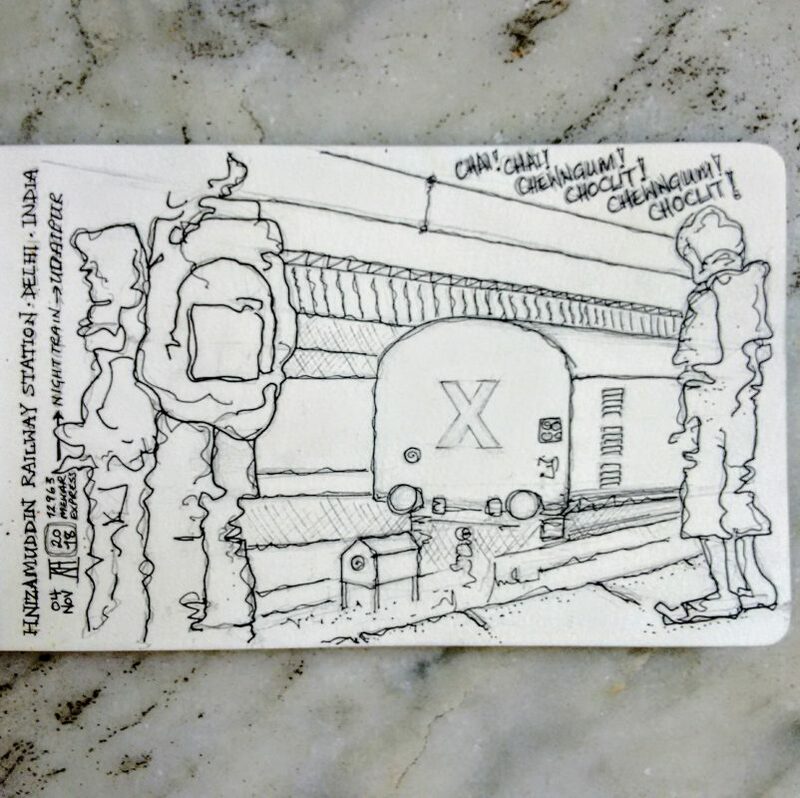 I got to the train station in New Delhi early with the intention to draw. It was a little overwhelming but a kind man insisted that I sit on his blanket with him and his son which made drawing more comfortable. My train to Udaipur left bang on time at 7pm and I had a good 12 hour journey in a bunked sleeping compartment. This is the view across Lake Pichola from the roof of the Moustache Hostel in Udaipur. Rajasthanis have famously luxurious facial hair, hence the name of the hostel. 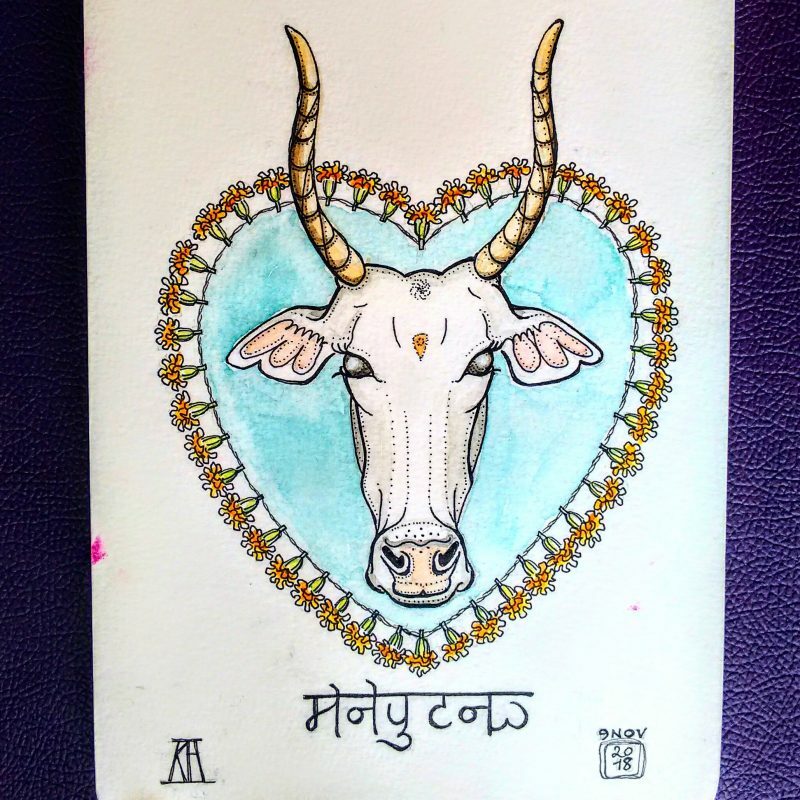 They then asked me to paint something in the space above the birds so I drew a design in my sketchbook inspired by a beautiful cow I’d seen on my first morning walk through the city. 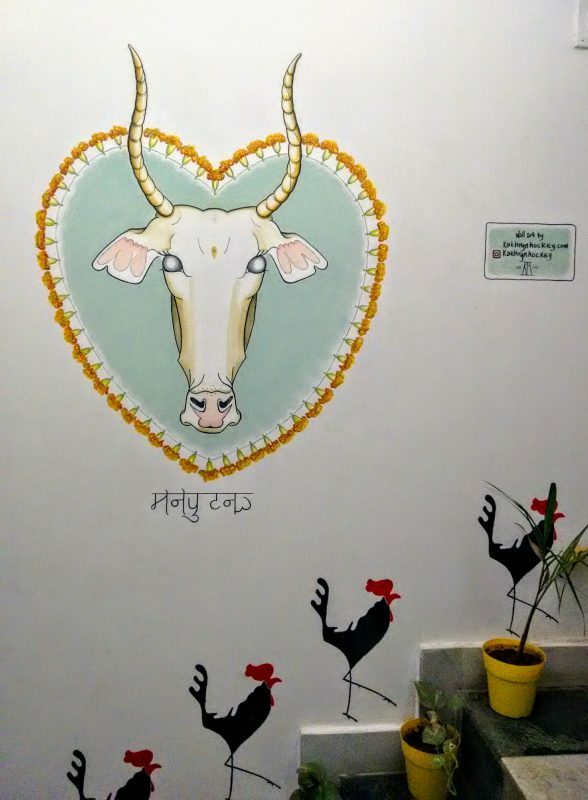 Painting in the reception area was a great way to meet people, and the cow and cockerels got a very warm welcome. 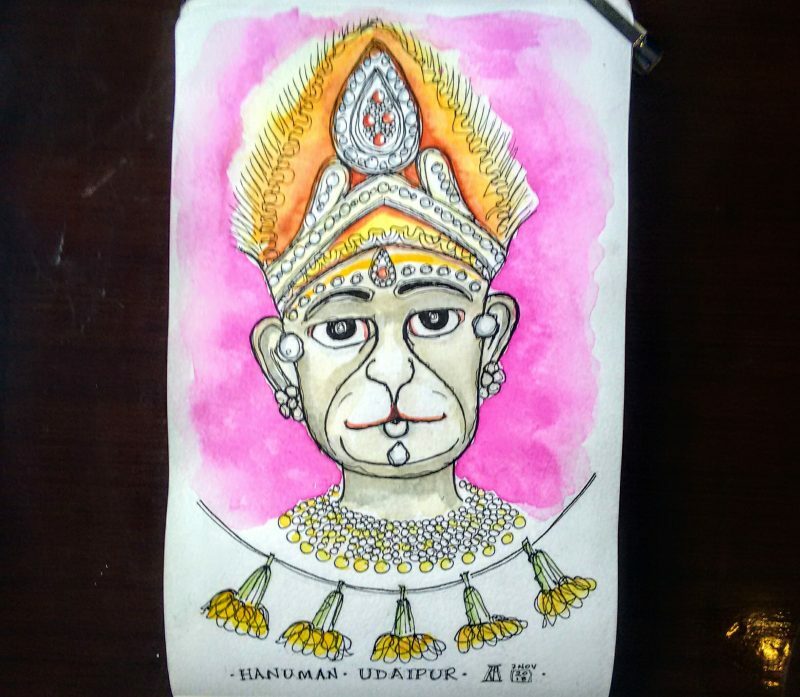 Here’s a pen and watercolour sketch I made at a little Hanuman temple in the street. 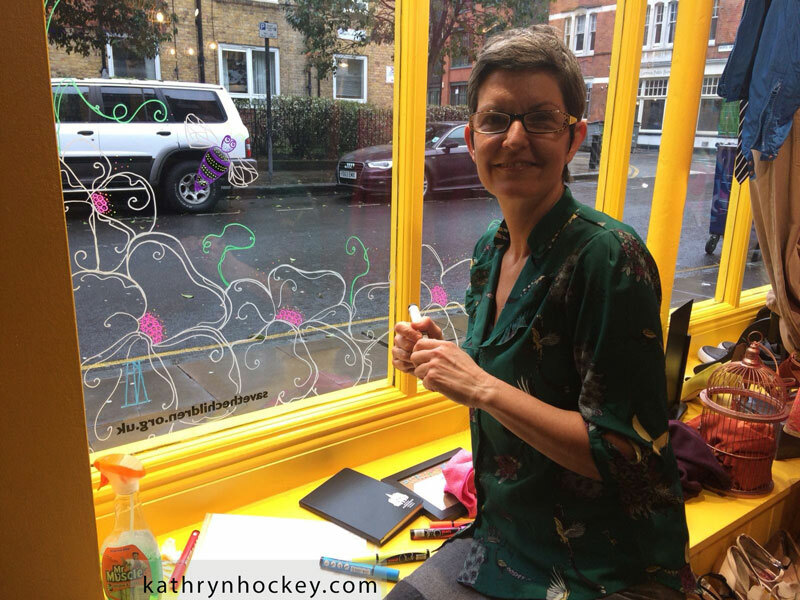 The lady selling flowers next door kindly lent me a stool to sit on while I drew. This is Yogesh, one of the Moustache Hostel team. 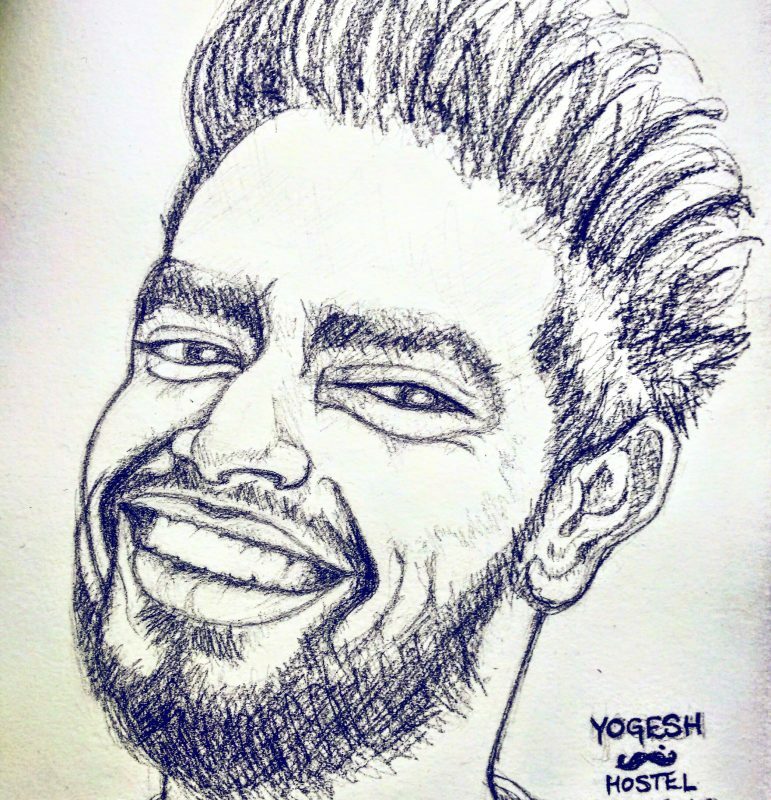 He asked me to draw his portrait so I worked in pencil from a photo. 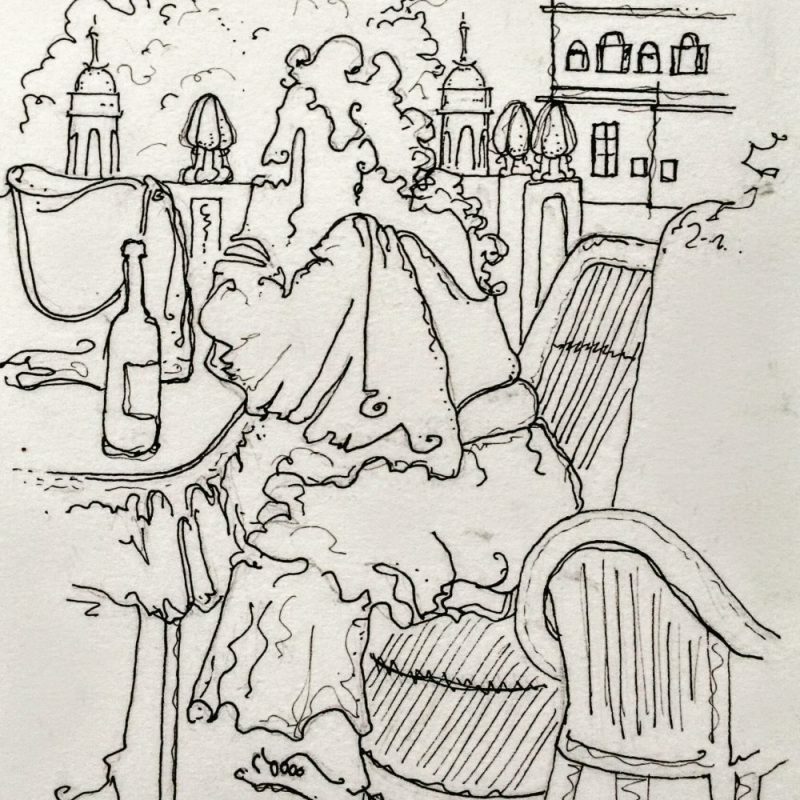 And here’s a quick pen sketch I made of a lady wearing a sari while she sat in a lakeside café. I’m sure she twigged that I was drawing her, she didn’t seem to mind but she did leave before I had a chance to add colour. 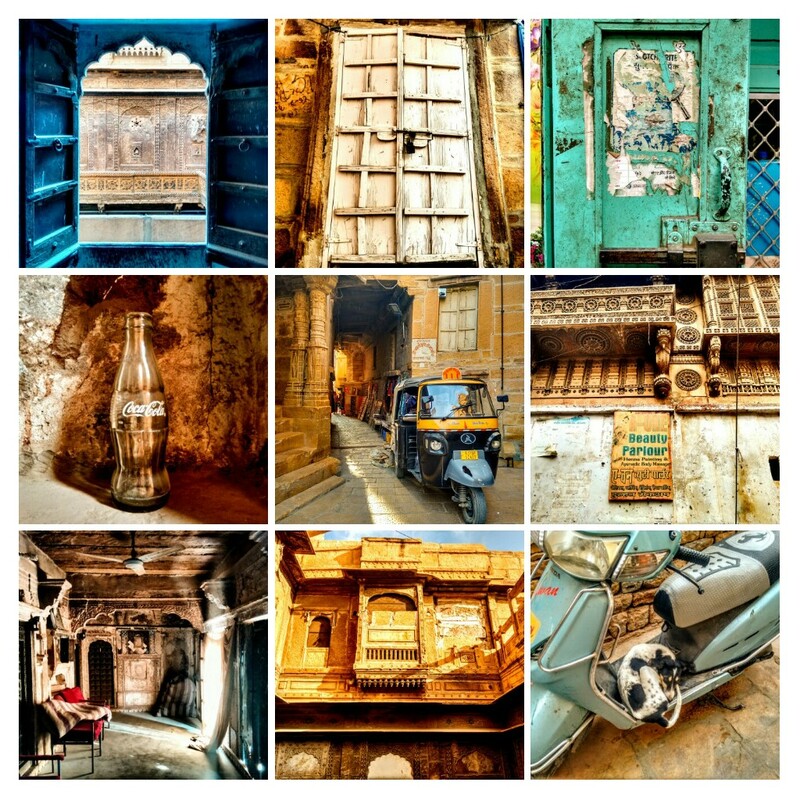 All in all a very enjoyable and creative first week here in India. 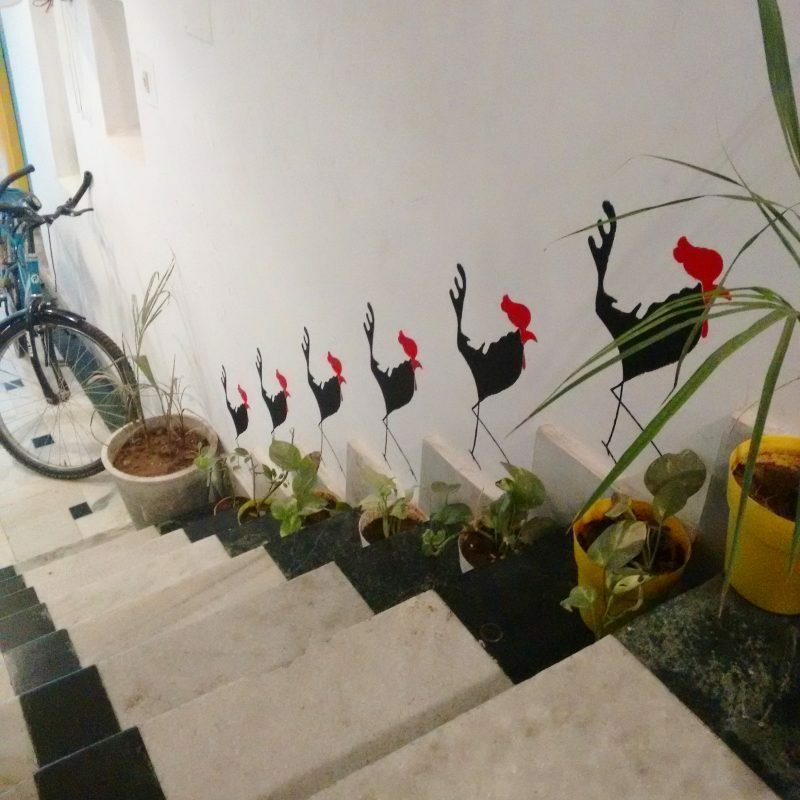 I’m leaving the Moustache Hostel today to go and spend a few days with an Indian family here in Udaipur. 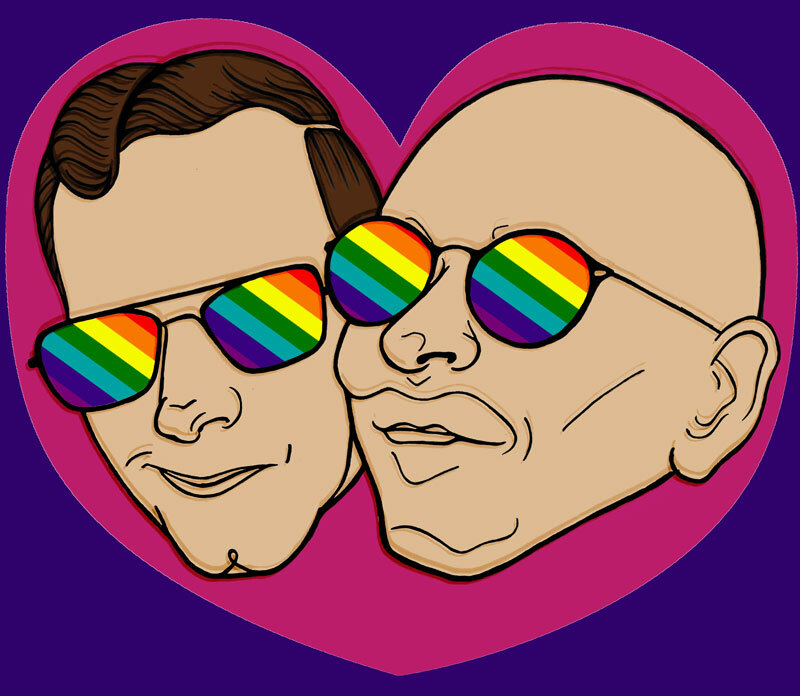 Two of my lovliest friends tied the knot in London earlier this summer, so I made them a wedding card featuring a joint portrait. 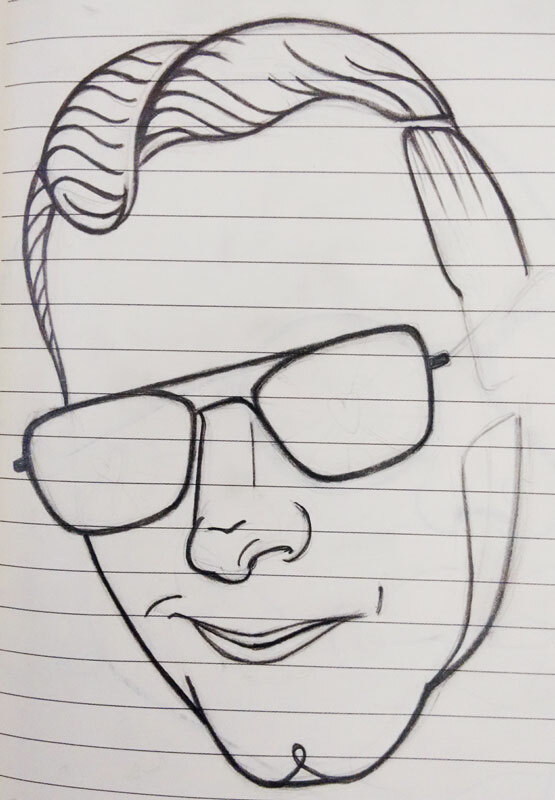 First I trawled through their Facebook albums for a suitable photo from which I drew a simple outline of each of them in pencil (below). 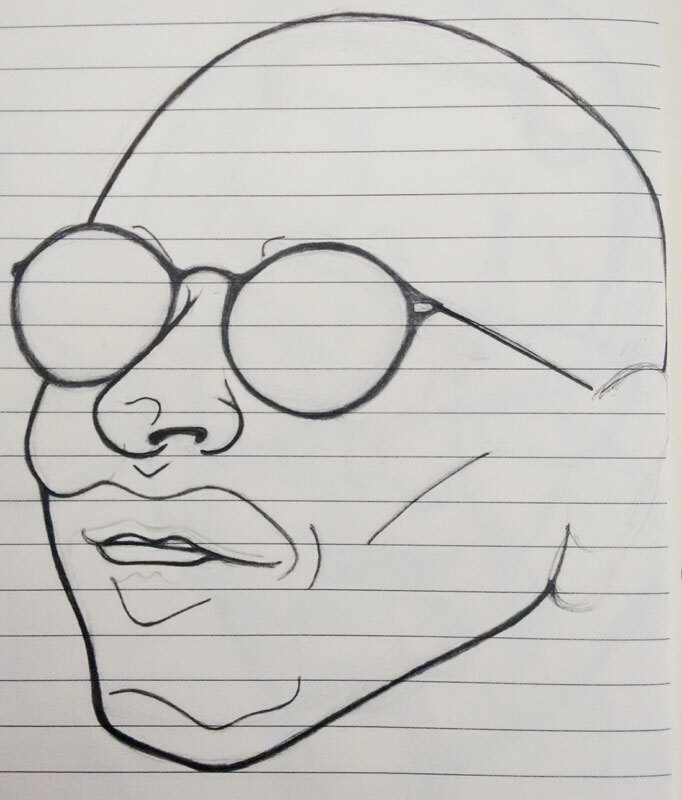 I made two separate drawings so that I could experiment with the joint portrait composition. 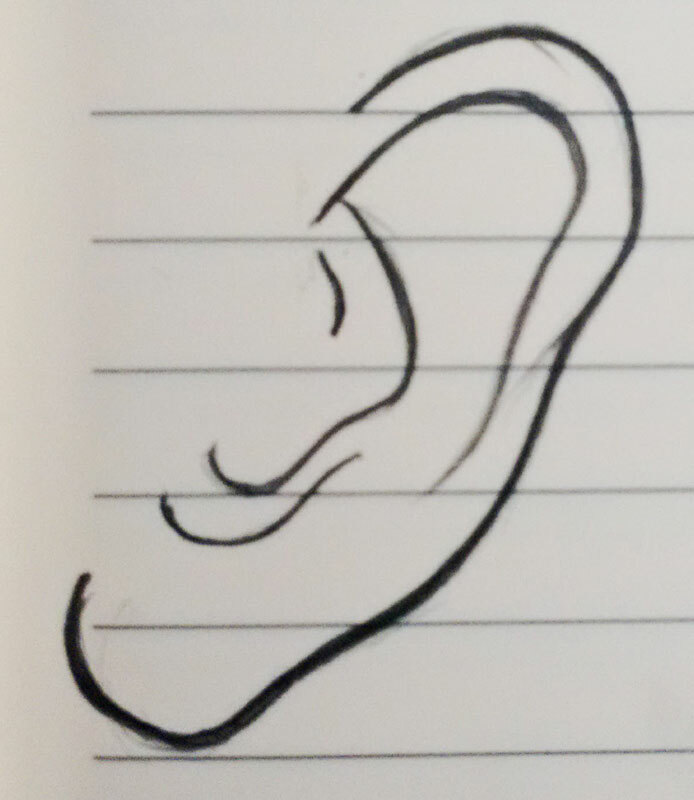 Having photographed my pencil outlines and uploaded them into Photoshop there was a space where an ear should’ve been so I went back to the drawing board and invented one. 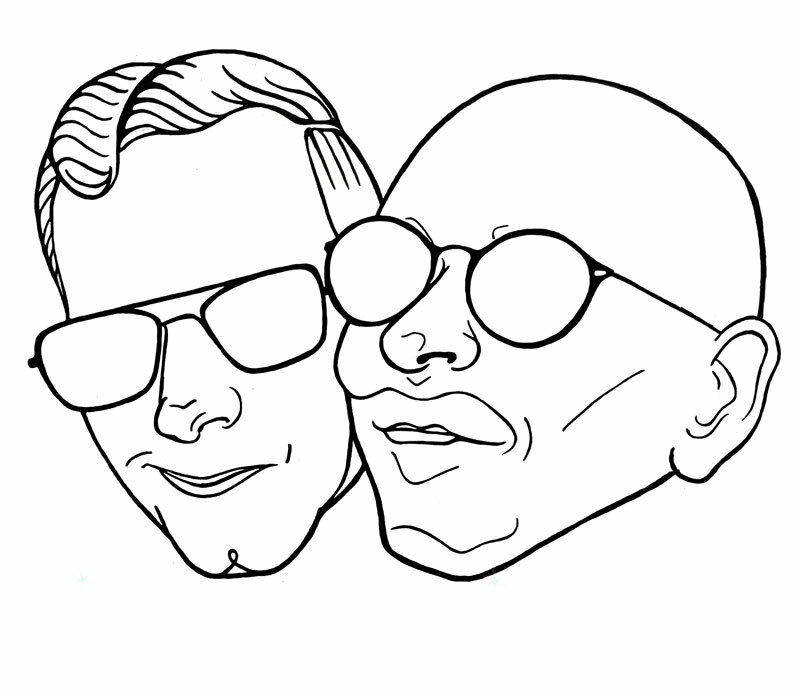 Having settled on the composition I ‘cut out’ and tidied up the line work in Photoshop (above). Working in layers I collaged the coloured elements, starting with the rainbow sunglasses (above). I found the generic rainbow and heart images from a google image search. 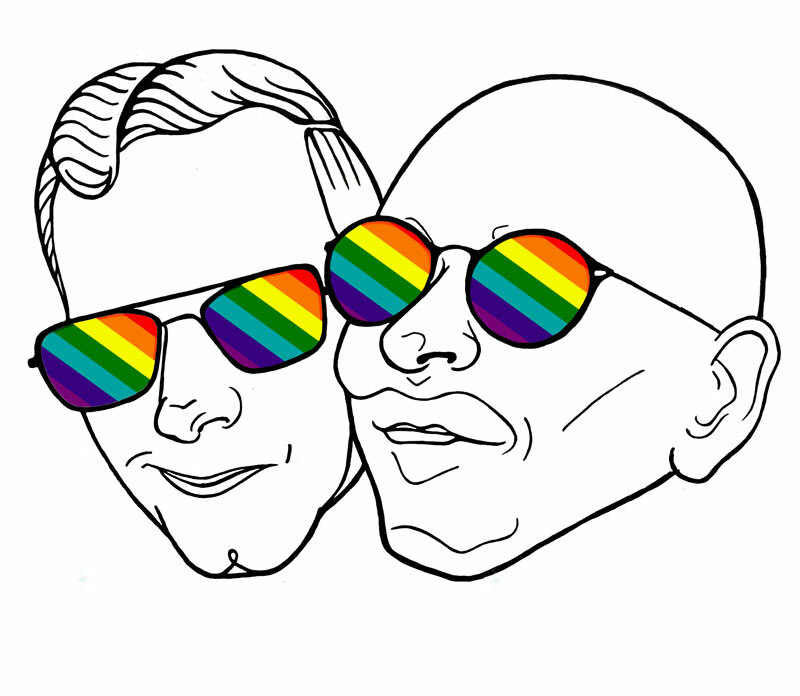 I block coloured the skin, hair and background with the paint brush / bucket tool. To add a little shaddow and depth I duplicated the line work layer twice, off-setting each new layer very slightly in different directions and setting the blending mode to overlay. On separate layers I used the brush tool at 0% hardness to add the skin highlights (white, 100% opacity, blending mode soft light), hair sheen (flesh tone, 100% opacity, blending mode normal) and darker skin tone (pink, 18% opacity, blending mode normal). I used the star pattern in the brush tool (white, size 600 approx, blending mode screen) to add the glint on the sunglasses in two layers. 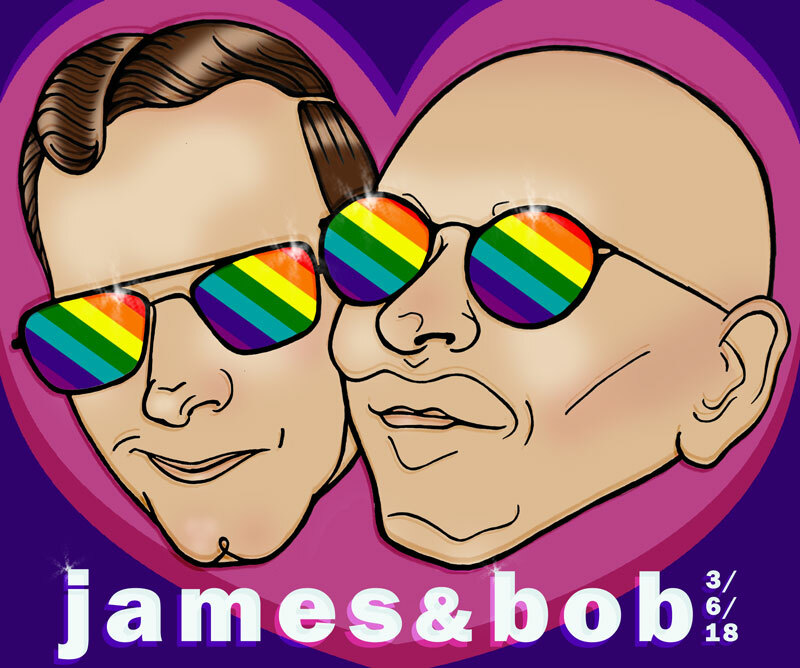 The final touches were the extra heart layer to pep up the background (white, 100% opacity, soft light blending mode); the text (white, 100% opacity, blending mode normal) with an offset layer behind it (white, 70% opacity, blending mode overlay) and the white glints on the text (same as for the glasses). 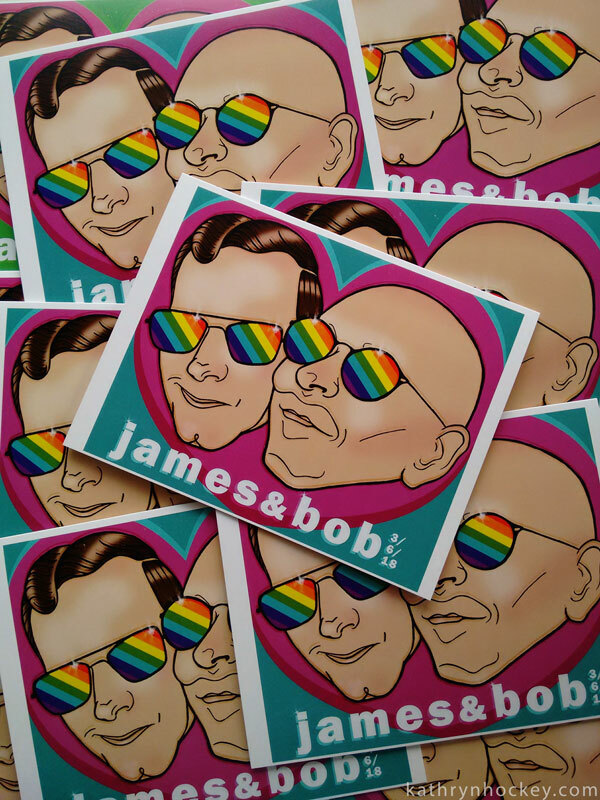 I was chuffed to bits when the grooms told me that they loved the image so much that they wanted to use it as their post-wedding thank you card. 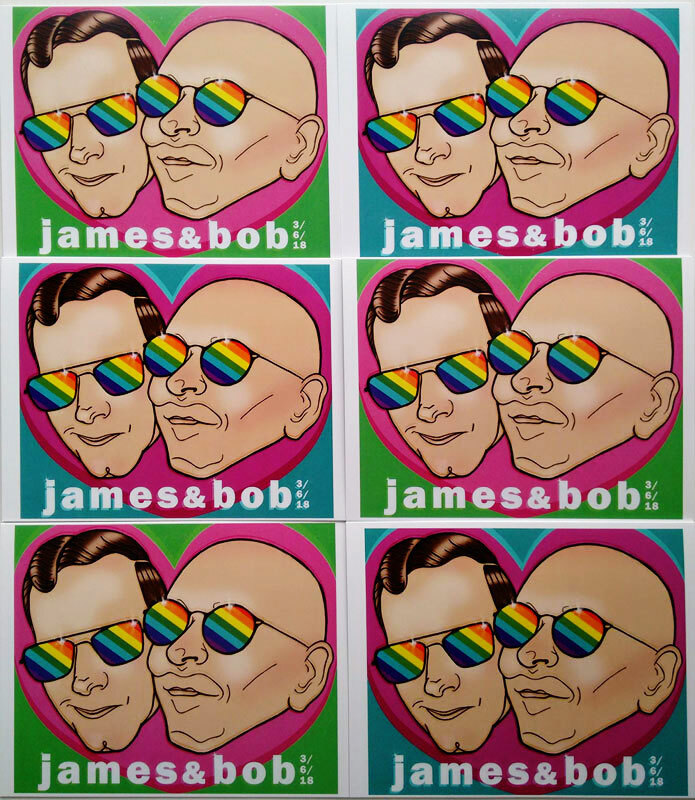 I sent them a couple of alternative colourways and their printer did the honours! 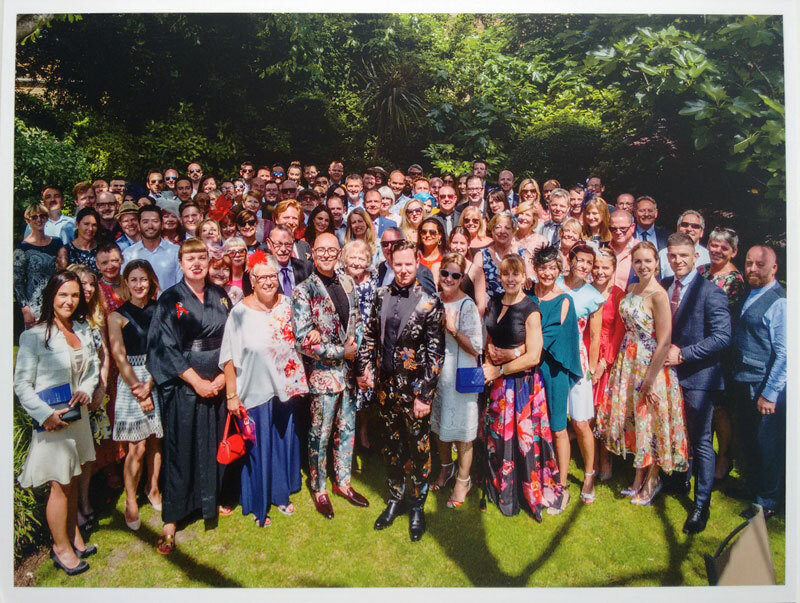 And here they are, the gorgeous couple (above) and surrounded by their friends and family on the glorious day (below). 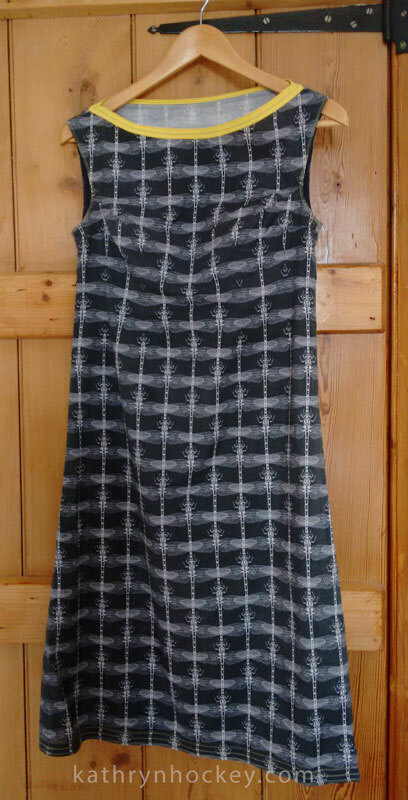 To accommodate my physical expansion since last year I recently made myself another summer dress from my grey dragonfly fabric. My finishing skills are improving! This time I followed my mum´s advice about French seams so the interior of the dress is much neater. 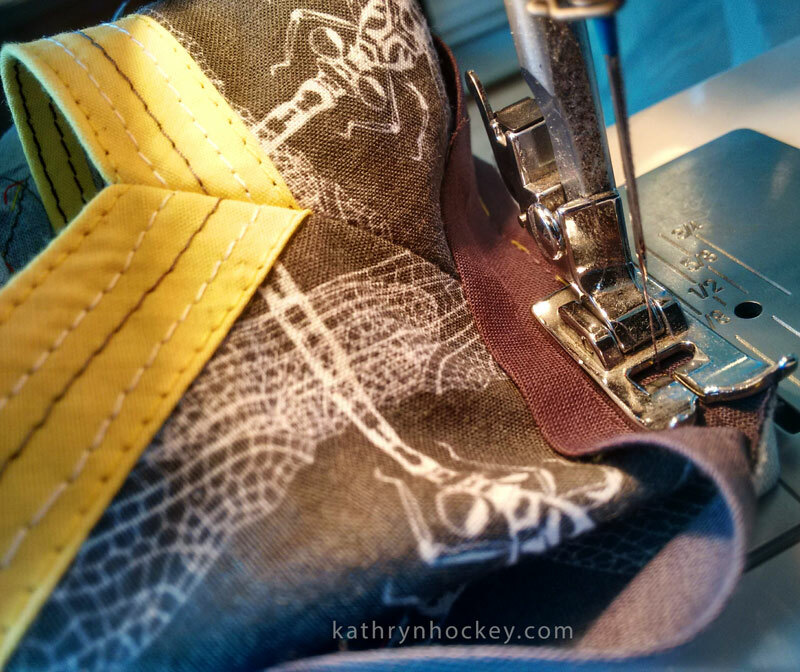 The arm holes are edged with grey bias binding with contrasting white and yellow top stitching while the neckline is finished with yellow bias binding with contrasting white and grey top stitches. It’s a comfy one and stylish too! 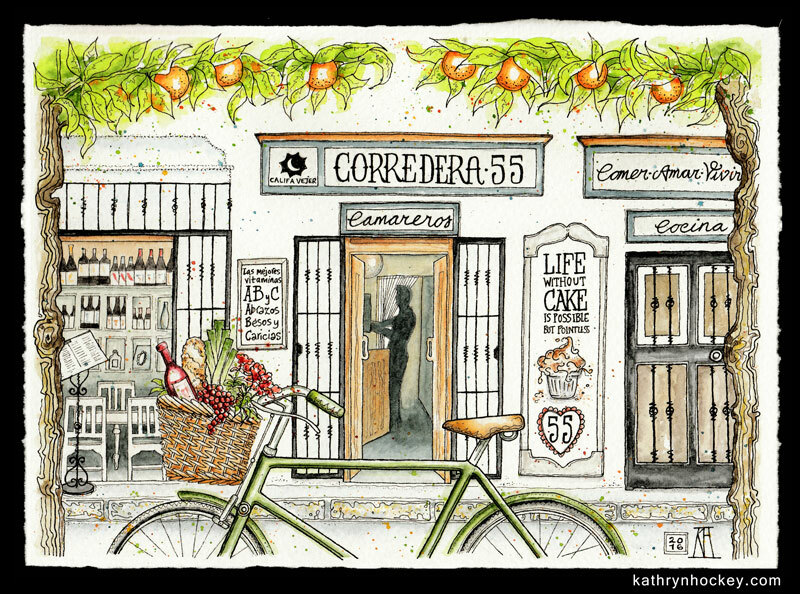 I had a lovely surprise during my recent visit to Vejer (after an absence of several months) – the fabulous people at the delightful Corredera 55 restaurant had updated their business card to include the pen and watercolour sketch I made of the restaurant facade back in 2016 (below). I knew they were planning to change their business card, in fact I prepared the file for the printer some time ago, but seeing the dinky little versions of the original painting sitting there in the restaurant made me smile. 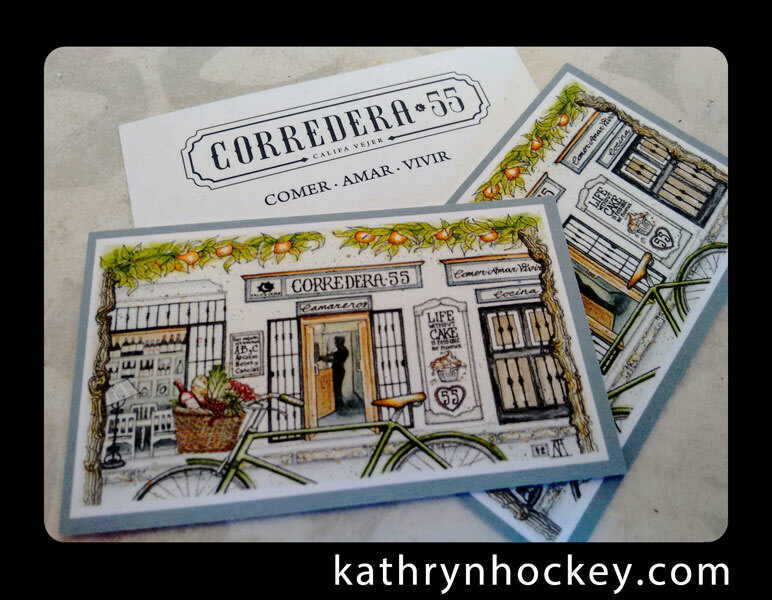 If you’re lucky enough to visit Corredera 55 this summer I can highly recommend the baked sardines with sumac, damascan lemon, black olives and cherry tomatoes; a luscious oily concoction which melts in the mouth and goes down particularly well after the green gazpacho; a pea, mint, avocado and cucumber variation of the traditional Spanish cold summer soup. 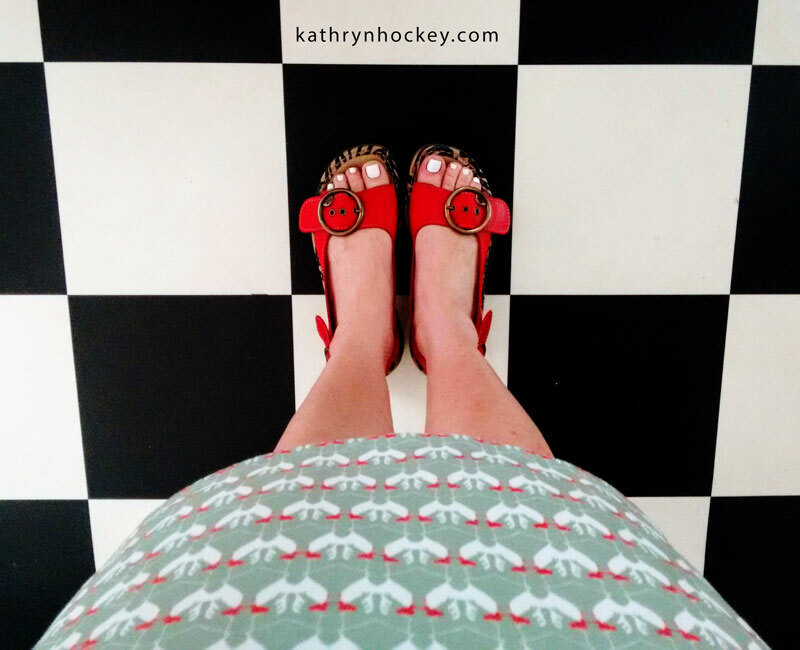 For my latest foray into textile design and home sewing I made myself a cotton dress to wear to my dear friends’ June wedding in London. 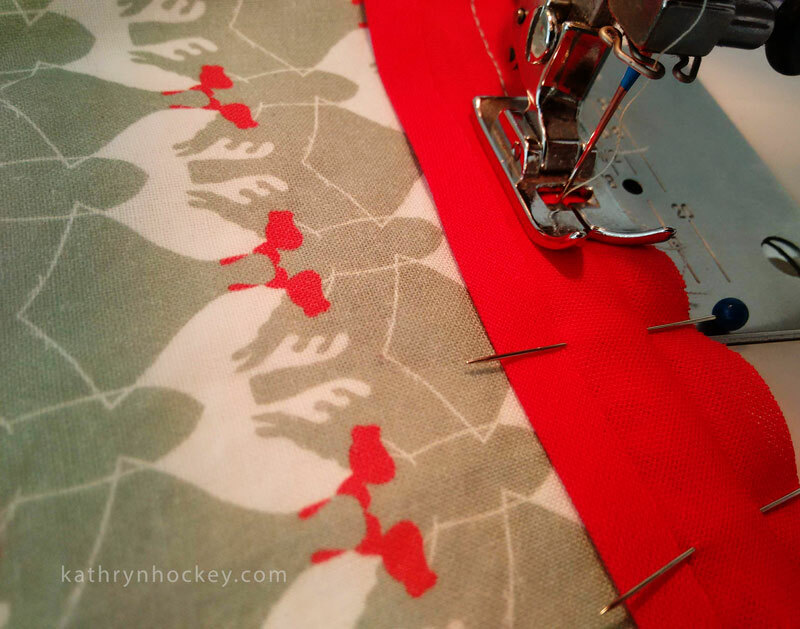 As usual I had the fabric digitally printed by Woven Monkey in the UK having made a white, red and pale green version of one of my cockerel variations; as my dad once said I’ve certainly got a lot of mileage out of that cockerel! 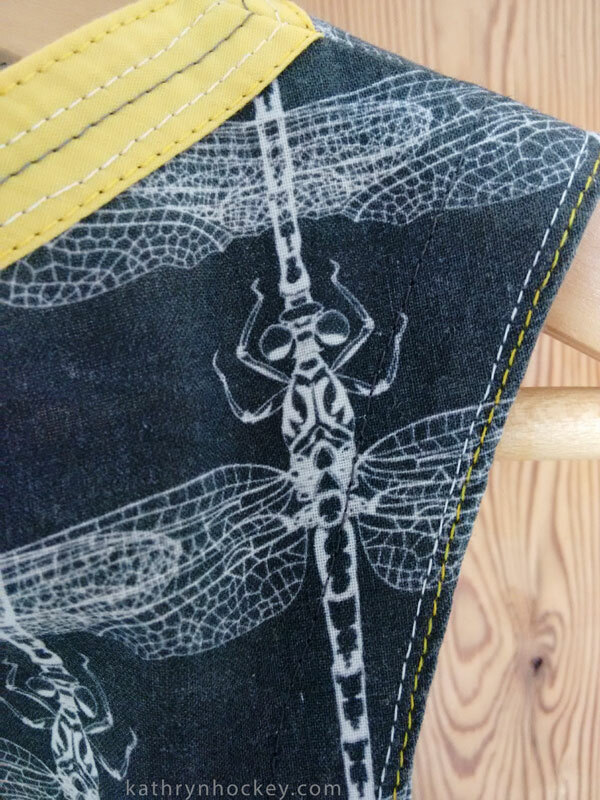 I decided to finish the hems with red bias binding to match the cockscombs…. 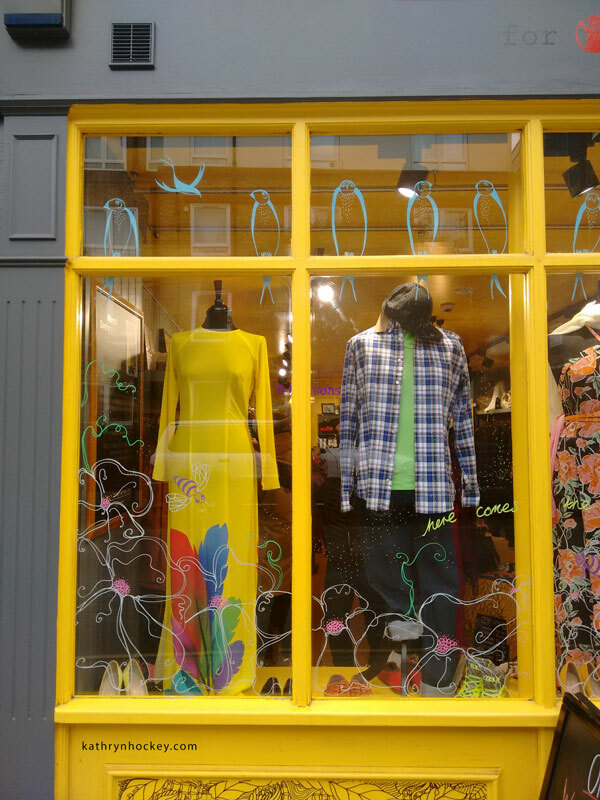 The dress stood up well to the festivities – just a couple of armhole stitches popped during the disco phase! And the wedding was absolutley wonderful. 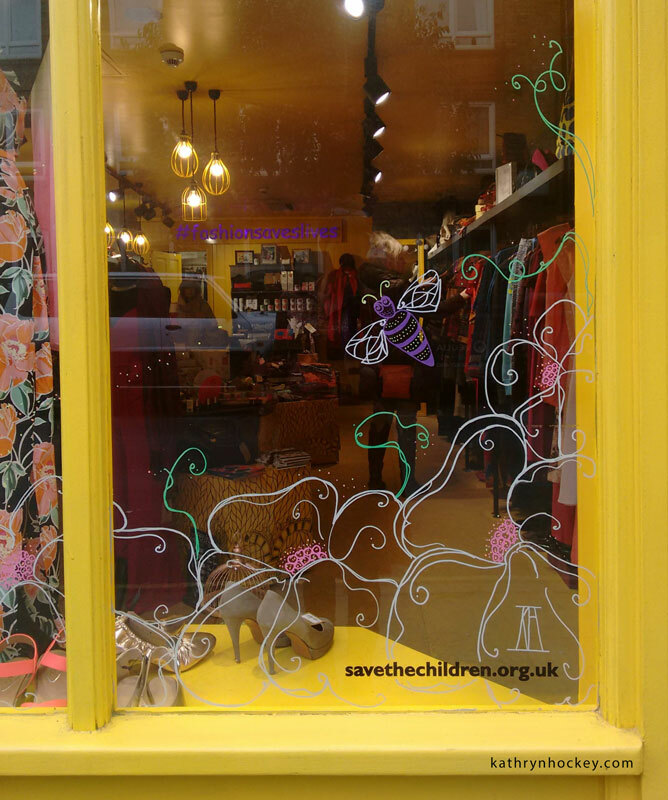 To herald the arrival of springtime the good folk at Mary’s Living & Giving Shop in Bermondsey Street (where I work as a volunteer for a few hours each week) invited me to design and execute an illustration for their window. 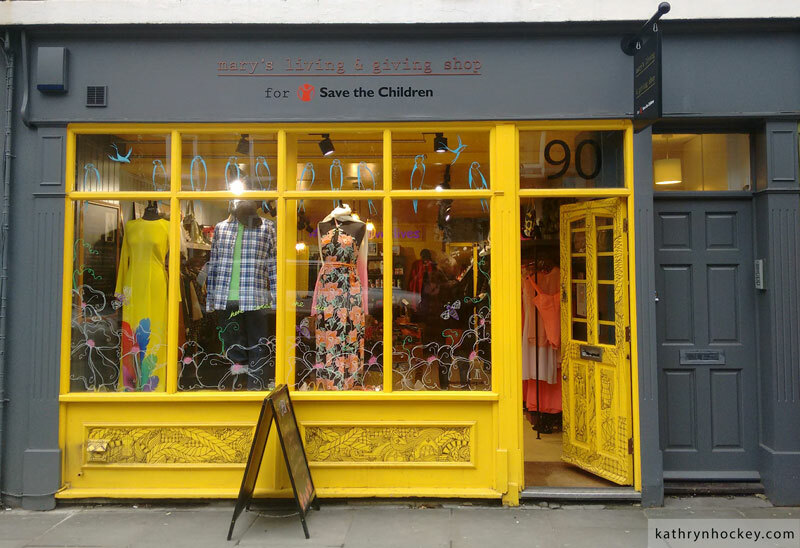 What a lovely project – and right up my street! 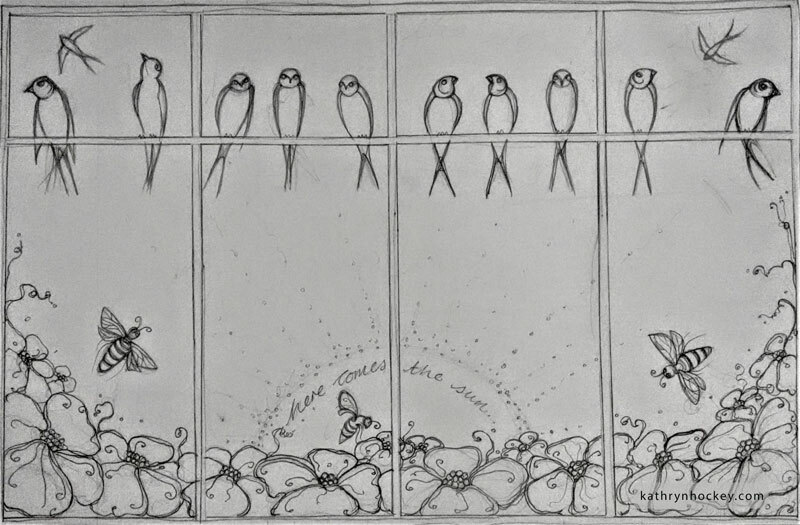 I decided on a flowers, birds and bees theme in a loose art nouveau style and made a sketch to scale. 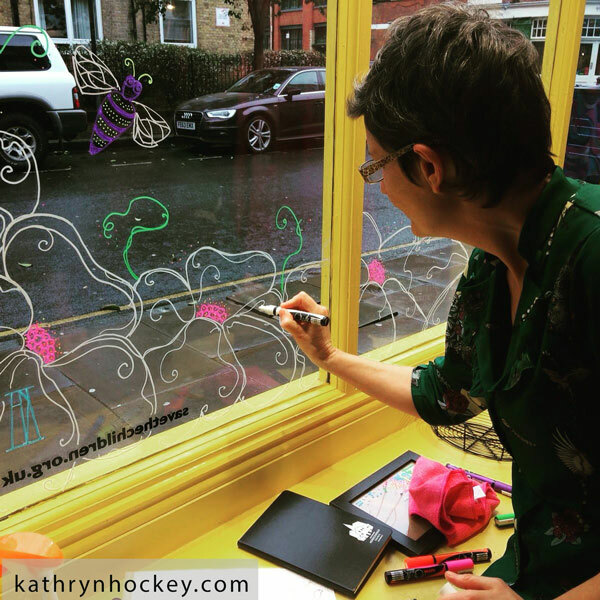 Before embarking on the window I had a little practise with the chalk pens on a small sheet of glass and assigned colours to the different elements of the drawing…. 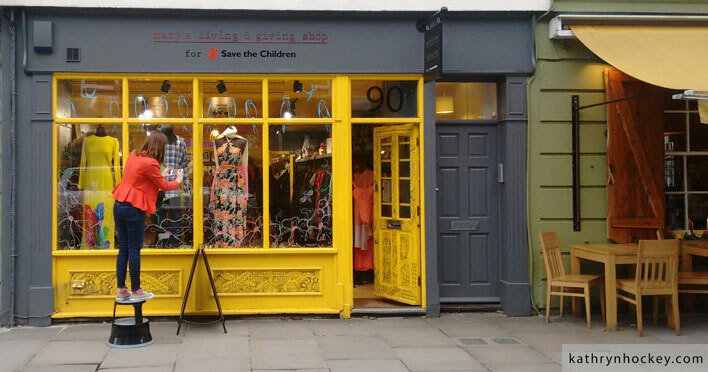 …while Kerry kindly cleaned the window in preparation for the obligatory ‘before’ photo. 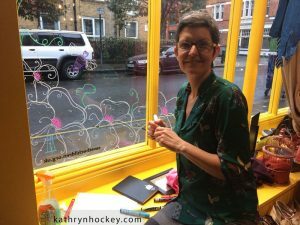 Here are a few photos of the completed drawing, which took a couple of sessions to finish… …needless to say the ‘here comes the sun’ caption is more of a wish than an observation during springtime in Britain! 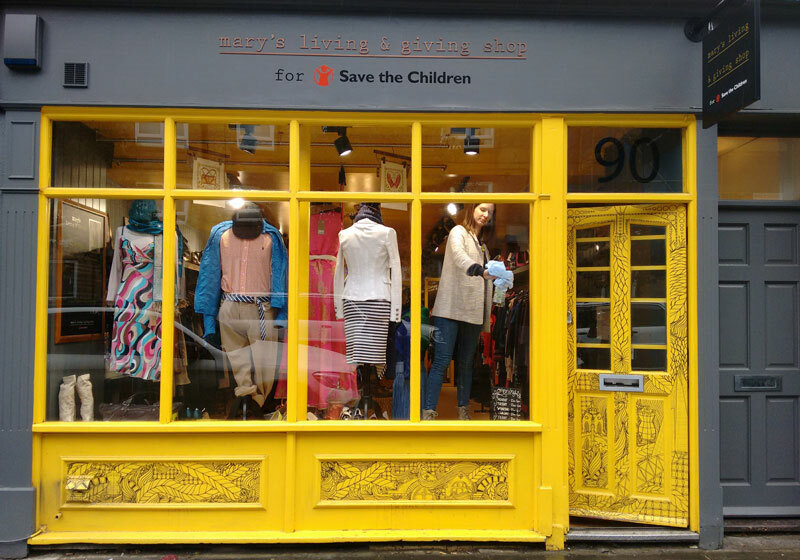 I really had so much fun with this project and am so grateful to the Mary’s Living & Giving team for trusting me with it – thank you! and her sister restaurant The Honest Goose on The Cut in Waterloo (above). 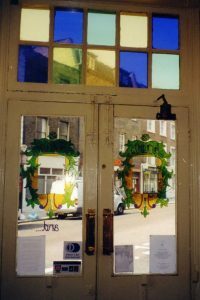 The Cabbage has since been converted to The Garrison Public House – my artwork didn’t survive but that tends to be the way with mural art unless you’re Banksy.